CATALOGUE OF THE VARIETIES IN THE DEMANHUR HOARD. Although this famous hoard of Alexander tetradrachms has already been partially studied and described by the present writer in the American Journal of Numismatics for 1911 and 1912, 1 there are nevertheless serious reasons for occupying ourselves, once more, with this extraordinary find. In the first place, the hoard at that time was only treated incidentally in explaining some observations made by the author as to the use of dies and the signatures of magistrates at certain of Alexander’s mints. The hoard is well worthy of more detailed attention than this. Also several thousand more coins from the find have since been seen and studied by the writer, and these contain about fifty important varieties not listed in the previous article. Finally, it is highly desirable that several erroneous statements, deductions, and attributions there made be now corrected in the light of a wider experience with the intricacies of the Alexander question. In those days the writer was but commencing his studies and was, naturally, only too ready to follow the lead of earlier writers, many of whose attributions have since proved fanciful. I Such coins in the writer’s own collection as came to him direct from the Demanhur deposit, mostly purchased in Egypt shortly after the hoard’s discovery. Some of the duplicates in this lot have since been ceded by the writer to the British Museum, to the collection of the United States Mint in Philadelphia (since removed to the National Museum, Washington), and to certain private collectors. II The collection of Gen. Ronald Storrs, and Mr. F. Munroe Endicott. These two enthusiastic collectors of the Alexander coinage were fortunate to have been in Egypt, in the diplomatic service of their respective countries, in the days of the hoard’s discovery. They early systematised their efforts and together were able to obtain specimens of practically every variety once contained in the find. Their collections were formed from the first pick of perhaps about four-fifths of the entire hoard. III A lot of over a thousand specimens secured by M. Étienne Bourgey of Paris. This was probably the only portion of the find which had not previously been culled by Gen. Storrs or Mr. Endicott, and so contained a few rare varieties not represented in their collections. The greater portion of this lot was later purchased by the present writer, though only after numerous specimens had been sold by M. Bourgey to various collectors. Among these were Dr. Pozzi of Paris, M. Pierre Saroglos of Athens, the British Museum, and others. IV A lot of over a thousand specimens which were brought back from Egypt by Mr. Azeez Khayat of this city. All of these coins, according to their general appearance and Mr. Khayat’s express statement, once belonged to the Demanhur find. It was Mr. Khayat who first brought the hoard to the writer’s attention. V Seventy tetradrachms in the Toronto Archaeological Museum which had been purchased by the Curator, Mr. C. T. Curelly, in Egypt at the time of the hoard’s discovery. VI Several small lots in the stocks of various dealers abroad, such as J. Schulman of Amsterdam, Messrs. Spink & Son of London, Dr. Jacob Hirsch of Munich, and others. Of all these coins the writer either secured the actual specimens or casts. 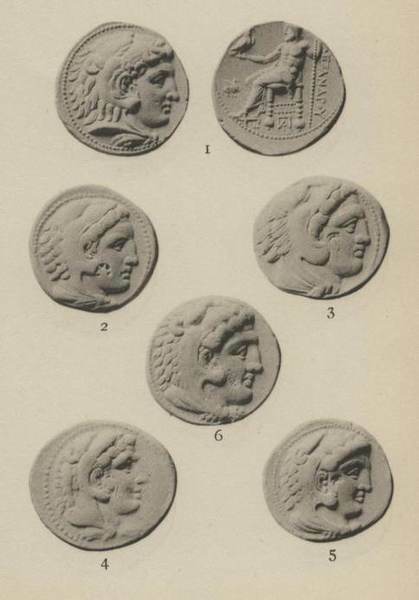 Many of the Alexander tetradrachms in the Th. Prowe Sale, Brüder Egger, Vienna, May, 1912, came originally from this hoard. VII A small group of tetradrachms in the Hermitage collection whose Demanhur provenance was kindly brought to my attention by the former curator, M. Alexis von Markoff. VIII Certain small lots actually owned or kindly brought to my attention by Prof. Milne, Mr. E. J. Seltman, Mr. Endicott, Rev. Jeremiah Zimmerman, and others. Lot III is now entirely dispersed, with the exception of about a dozen specimens in very fine condition. Lot IV also no longer exists as an entity. Those pieces which had been secured from it by Mrs. Draper, Mr. Thomas B. F. Curtis, as well as many purchased by Mr. T. L. Elder of this city, have since passed into the possession of the author. The remainder of Mr. Khayat’s lot is now divided between the American Numismatic Society, Mrs. Agnes Baldwin Brett, Messrs. L. V. Case, V. Hammer, and the writer. Before disposing of his portion of Mr. Khayat’s lot, Mr. Elder published a series of six plates in half tone showing the obverses and reverses of about 300 tetradrachms. It should be noted, however, that no. 98 on Plates I and II was not from the find at Demanhur. It is a tetradrachm of Ptolemy I (type of Svoronos no. 265) from a hoard of these coins found also in Egypt but at a slightly later date than the Demanhur hoard of Alexanders. This material, amounting in all to 4826 specimens, constitutes what now remains to us of the great Demanhur hoard. That this, however, is not the entire find is certain. Nevertheless, in the writer’s opinion, the material actually before us apparently comprises a very considerable portion of the original deposit. It is but natural that in the early days of the hoard’s discovery extravagant rumors concerning its size should have been current in Egypt, and generally believed in. The somewhat unusual occurrence of many thousand Alexander tetradrachms suddenly appearing upon the market not unnaturally gave the impression of a very much greater number having been found. From impression to assertion is no very great step—and a good story seldom loses in the telling. Besides, the greater the find the more thrilling is the tale of treasuretrove. Above all, in Egypt one has grown accustomed by actual experience to the unearthing of extraordinarily large hoards of ancient coin. 2 It is evidently thus that the statement (given credit to everywhere in Egypt) that the Demanhur find contained perhaps about fifteen thousand coins, and even twenty thousand or more, first gained currency. The writer’s personal experience, based on two trips to Egypt and many years’ acquaintance with collectors and dealers the world over, has made him somewhat skeptical of these large figures. In spite of a most diligent search, now continued over the space of more than fourteen years, no more than the above - mentioned 4826 specimens, which can be definitely traced to Demanhur, have been brought to light. In addition, he has seen perhaps some two or three hundred pieces (dispersed among the trays of various dealers and collectors) whose appearance and previous history might suggest an assignment to our hoard. But because of the uncertainty they have not been included in our study. Doubtless many of the Demanhur coins were bought up by tourists in Egypt during the days when the coins were on the market—and such are probably definitely lost to us now. It is possible that others were exported to Syria to supply a demand there, and the writer has indeed heard several statements to this effect. It is also quite probable that many of the poorer specimens were even melted down for their bullion value. To the writer’s own knowledge this actually did happen to a considerable portion of a large hoard of Athenian tetradrachms when their numbers and the comparatively restricted demand threatened a glut on the market. That this fate overtook any very large number of the DemanhurAlexanders cannot be proved, nor has the writer heard of any statement to that effect. The hoard apparently contained very few pieces disfigured by the punchmarks and counter- stamps so often occurring on Greek coins found in Egypt. To suppose that all such coins had been picked out and melted down before the remainder was placed on the market is hardly reasonable. There is always a certain demand for coins of Alexander the Great, not only by collectors but also by noncollectors and tourists to whom the name of Alexander ever makes a strong appeal. The writer would not therefore place at any very high figure the number of Demanhur coins melted for their bullion, though he does not thereby mean to deny that this might not have happened to some. The most conservative estimates secured by the writer have always averaged around the figure ten thousand for the total number of coins once contained in the hoard. Unfortunately the original finders have never been discovered and it is they alone who would be in any position to know the real number of the coins found. The hoard in its entirety apparently never passed through the hands of any one person, with the result that we shall probably never know the exact number of pieces it once contained. If, however, to the definite number of 4826 which we now possess we should add the very generous allowance of 2500, or even 3000, to cover such pieces as have disappeared in the trade or been melted down, it seems to the writer that we would have a figure tolerably close to the original number. Concerning the actual find-spot of the hoard nothing new has been ascertained since the previous article. Sig. Dattari’s account, kindly supplied to the writer in 1911, still holds good— though it might be well to modify somewhat, as we have seen, the probable number of coins found. In his letter Sig. Dattari stated that the find was made by natives, that its true provenance was impossible to determine, that it eventually fell into the hands of several merchants residing in Demanhur, and that it took its name from this latter fact. He further stated that the deposit, containing anywhere from ten to twenty thousand tetradrachms, had been divided into five parts “of several thousand coins each”; and that of these, one part had been sent to Alexandria, the others to Cairo for disposal. Perhaps two of the groups (III and IV) described above represent two of these original divisions. If so, we then possess a slight corroboration of our suggestion that the hoard originally contained not more than some seven or eight thousand at the outside, as both M. Bourgey’s and Mr. Khayat’s lots numbered only a little over a thousand coins each. From a conversation on this subject recently held with M. Seymour de Ricci, who chanced to have been in Egypt engaged in his archaeological work at the time of the hoard’s discovery, it seems probable, in his opinion, that the hoard was really found somewhere in the vicinity of Demanhur and that this occurred sometime towards the end of 1905. M. de Ricci is also under the impression that the hoard contained over ten thousand coins, but states that he possesses no definite information upon which to base an opinion, other than hearsay and the statements current in Egypt at the time. Although an unkind fate has willed it that the great Demanhur hoard should have been broken up and largely scattered before it became accessible for study, our loss has been partially made good by the fact that, in all probability, we now know every variety it once contained. This good fortune is almost entirely due to the circumstance that Mr. Endicott and Gen. Storrs had been actively collecting in Egypt not very long after the great find was made. They displayed such an indefatigable enthusiasm and persistency in acquiring all varieties possible for their collections that few indeed can have escaped them. The present study would have been all but impossible, certainly it would have lost much of its scientific value, had it not been for the kind assistance and the access to their collections so readily granted by these gentlemen. Their collections, when combined, furnished practically all the varieties listed in the following pages. The remainder occurred either in that portion of III which M. Bourgey sold to the writer, or among the specimens which Dr. Pozzi, M. Saroglos, and the British Museum had previously selected from the same source. The material at our disposal has here been divided among the nine large geographical divisions in which there were active mints during the reigns of Alexander the Great and Philip Arrhidaeus. These are: Macedonia, the Peloponnese, the Propontis, South-westernAsia Minor, Cilicia, Cyprus, Syria including Phoenicia, Babylonia, and Egypt. Under these headings the coins have been again subdivided into series, each series attributable to one mint. This division of the material before us has been governed by a close study of the style, fabric, and appearance of the coins themselves. The mass of material placed at our disposal by such a find as that of Demanhur makes it comparatively simple to sort the coins into greater or lesser groups which are easily distinguishable, the one from the other, by marked differences in style and fabric. It is obvious that within the boundaries of each larger district of the ancient world there had flourished, for many years, local schools of art exercising undoubted influence upon the diecutters of that particular region. By the time of Alexander’s arrival the technique and style peculiar to the local mint establishments had become crystallized into a more or less hard and fast tradition. 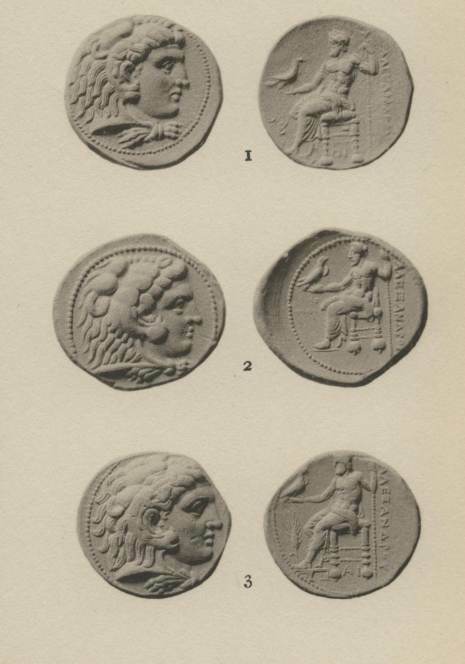 As Alexander in each case apparently employed the local die cutters and mint appliances for the issue of his own coin, we are thereby greatly assisted in sorting and attributing, with a fair amount of accuracy and probability, the greater portion of his coins—although they all bear uniform types whether struck in Macedonia or distant Babylon. For Macedonia, then, we find a strong, vigorous, but heavy (one might say almost turgid) style. Though there is an unmistakeable similarity throughout the entire product of the Macedonian mints, it soon becomes evident that die cutters of very diverse ability were working at one and the same time under the influence of a local style and tradition. The Peloponnesian issues show a higher degree of art and a finer workmanship, but it seems evident that the die-cutters were accustomed to work on a smaller scale than that of the Attic tetradrachm. It is a fact that the contemporary gold staters and distaters of Alexander from this mint are much more pleasing and successful as works of art than the larger tetradrachms. The issues of the Hellespontine region are reminiscent of the preceding autonomous coinages of this district; while the issues for Caria and Lydia show to a striking degree the delicate and graceful influence of Ionian artists. The Heracles head of the obverse has the soft contours and delicate modelling of that school, hardly suitable for the brawny hero of mythology. The Zeus figure on the reverse is a dainty specimen of gem engraving. On the whole, while these coins show a perfection of ability and technique that is very attractive, they lack the vigor of the ruder Macedonian products. The Cilician and North Syrian issues are, at first, merely copies of the immediately preceding satrapal coins struck here by Mazaeus and other Persian governors. 3 There can be no doubt but that the same die-cutters continued to work for Alexander after his conquest of these districts. On the Island of Cyprus—as is only natural in view of its geographical position and commercial relations—we find a curious blending of the Greek art of Asia Minor, the eastern art of Cilicia, and the technical appliances and customs (fixed dies, etc.) of Phoenicia. The typically oriental style of the earlier Phoenician coinages was carried over onto the succeeding Alexandrine issues. Combined with this style there were also continued in use the local customs of each mint. Thus, unlike the other Phoenician mints, the Aradian issues were struck from loose dies as had always been the practice here; the coins of Byblus bear the abbreviated name of the local king; while the Sidonian issues are struck from fixed or adjusted dies and bear the regnal years of the reigning prince. At all of these mints we find the local style continuing to develop independently, up to a certain point. Later it became influenced by the beautiful style of the coins emanating from the mint at Egyptian Alexandria. The Alexander issues of Babylon are conspicuous for a style and character all their own, and destined to exercise a great and far spreading influence on the later coinages of Persia, Mesopotamia, Syria, and even portions of Asia Minor. For the newly opened mint at Alexandria in Egypt its great founder seems to have secured Greek artists of first rate ability. Their productions are well worthy the future fame of what was destined to become one of the greatest art centres of the ancient world. The dies that were here produced are exceedingly handsome, perhaps the finest to be found in the entire Alexander series. These beautiful coins found instant approval at the many coining centres of the eastern Mediterranean and were soon being used as models in Byblus, Berytus Sidon, Ake, Citium, Amathus, and at several other as yet unidentified mints of the neighboring districts. Thus we are enabled to distinguish by means of certain well defined lines of divergence, various groups in the general mass of the Alexander coinage. It is further quite possible, by paying strict attention to minor details of style and technique, and above all to the sequence of dies and their use in consecutive issues, to subdivide these larger groups into their component series—each series the issue of a single mint. Unfortunately it often proves to be a much more delicate matter to suggest the name of the mint itself. Under Alexander and his immediate successors there are only isolated cases where special monograms or symbols are used to designate the mint of a certain issue. It is distinctly noticeable that only the semi-autonomous city-states of Phoenicia and Cyprus were allowed thus to sign their respective coin-issues of the Alexander type. We are therefore led to suppose that the use of special marks of origin show these coinages to be a municipal rather than an imperial undertaking. The remaining Alexander coinages of this time were evidently struck under the jurisdic- tion of imperially appointed officers in such provincial mints as were at the command of the central government (either of that particular province or satrapy, or of the empire as a whole). Therefore only the monograms and symbols of the responsible mint officials appear upon the coins. As stated above, by means of style we are indeed able to distinguish the issues of the larger geographical units. Where only one mint was in operation in a single province the name of this mint can then be determined with comparative ease, but where there were evidently two or more mints in operation at the same time, the problem immediately becomes more complicated and difficult of solution. Now the superintendents of a particular coinage, as we have seen, guaranteed their issues by placing the monogram of their name, or some personal symbol, in the field of the coin issued by them. Alexander’s empire, by its very nature, was such a cosmopolitan institution that little can therefore be gained by paying attention to the seeming local significance of any one of these sym- bols. A Greek magistrate in some eastern mint might conceivably choose as his private mark the symbol of his native town — but this evidently furnishes us no clue whatsoever to the actual city in which his coin was really struck. Again, the symbols chosen are, as a rule, quite banal, such as thunderbolt, caduceus, amphora, club, etc., etc. These might have been used anywhere in the ancient world. In certain instances something may be gained by an intensive study of a whole series of such magistrates’ symbols appearing on coins which, by their style, must have come from one mint — but this is an uncertain clue to follow and usually leads to ambiguous results. In view of these difficulties and the true scope of the present articles on Alexander hoards, 4 we can only outline the reasons for assigning the various series to certain mints, or, failing this, to show briefly why no mint name can as yet be suggested. In other words, the discussion of attributions here must be looked upon as merely something in the nature of notes. The present series of articles is primarily intended, as stated in the introduction, to place on record unpublished or otherwise important finds of Alexander coins, rather than to be a final treatment of the whole subject. These articles, in fact, are but the basis for such a treatment. In arranging the following list of the Demanhur coins the first column will be found to contain the serial numbers of the coins, while the second column gives us the number of specimens found of each particular variety. The third column is devoted to the symbol or monogram which distinguishes each variety, and the fourth column gives the reference to Muller’s Les Monnaies d’Alexandre le Grand, Copenhagen, 1855. In this column a dash indicates the absence of that particular variety in Müller’s work, though the coin may have since been published by one of the many students in our field. In the cases of Tarsus, Myriandrus, Sidon, and Ake the writer’s own numbers have been substituted in the place of Müller’s, as for these mints the latter’s list has proved to be very in- adequate. In the fifth column are found references to the plates. In the case of the present publication the plate numbers are in Roman capitals as I, II, etc., while the plate numbers in Arabic numerals refer to the writer’s previous study of the Demanhur hoard. The sixth and last column contains the indications of the general condition of the coins of each variety as found in our hoard. For this purpose the following abbreviations have been adopted: W (worn) to denote coins that have seen a greater amount of circulation, though it must be remembered that none of the coins in the find were worn really smooth; VG (very good) to designate coins that are well preserved though they may have been in circulation for some time; F (fine) and VF (very fine) to denote coins that are practically uncirculated; B (brilliant) to designate coins apparently fresh from the mint with their surfaces still sharp and brilliant. On the whole the condition of the coins in the Demanhur deposit averages very high indeed. Not only had the majority of the coins seen comparatively little cir- culation when their former owner consigned them to the earth, but since then the deleterious action of time and the salts in the ground have affected but few. There are indeed certain specimens from the find which are covered with a heavy agglomeration of thick purple oxide, as shown on Plate I, nos. 1-3. Many of these also had fragments of terra cotta embedded in the oxide. But the majority of the Demanhur coins had only a very thin coating of oxide, and that usually merely in spots, while the remainder still present their original appearance at the time they were buried nearly twenty-two and a half centuries ago. From the foregoing considerations it seems likely that the Demanhur coins were once contained in several terra cotta jars. One of these had evidently, in the course of centuries, become very badly broken, thus allowing water and the various chemicals in the earth to attack its contents. Those coins which lay nearest the sides of the jar gradually became heavily coated with oxide, in one or two cases — as noted by the writer — several coins coalescing into one conglomerate mass. To some of these, furthermore, fragments of the broken jar still continue to adhere. The coins which lay in the centre of the jar’s contents were apparently but slightly attacked. On the other hand, one or more of the companion jars must have remained absolutely intact throughout the centuries, in order to account for the exceptionally splendid condition in which such a large proportion of the coins still are to this day. Returning to our lists, it has already been stated that the entire material presented by the hoard is divided according to the provinces of Alexander’s empire. The issues of each mint have again been divided into groups and series, approximate dates being assigned to them wherever possible. As we are limiting ourselves, in the following pages, strictly to the coins actually contained in the find it will not always be possible to discuss the dates in detail — that will have to be deferred until a larger number of the Alexander hoards will have been published and so made available to all. As the types of the Alexander tetradrachms remain constant throughout, it will not be necessary to describe each coin. In general, then, we find a young head of Heracles on the obverse turned to the right. In the rare cases where the head faces to the left special mention will be made of that fact. On the reverse the seated Zeus invariably faces to the left. As a general rule Müller’s observation 5 still holds good, namely, that on the earlier issues the legs of Zeus are placed parallel to each other, on the later the right foot is drawn back and is to be seen behind the left. But this diversity of position had not ceased by the time of Alexander’s death, and the older type is often found continuing in certain mints until well into the third century B.C. The kingly title appears on a great many of the Demanhur coins and its presence is always specially noted in the catalogue. No. Specimens. Monogram or Symbol In field. Müller. Plate. Condition. Group A, circa 336 to 334 B. C.
Group B, circa 333 and 332 B. C.
Group C, circa 331 B. C.
Group D, circa 330 and 329 B. C.
No. Spec. In field. Müller. Plate. Condition. Group E. circa 328 and 327 B. C.
Group F, circa 326 B. C.
Group G, circa 325 B. C.
Inscribed: ΑΛΕΞΑΝΔΡΟΥ ΒΑΣΙΛΕΩΣ or ΒΑΣΙΛΕΩΣ ΑΛΕΞΑΝΔΡΟΥ. Group H, circa 324 and 323 B. C.
Group I, circa 322 and 321 B. C.
Group J, circa 320 and 319 B. C.
Symbol in field. Beneath throne. Group K, circa 318 B. C.
No. Spec. In field. Beneath throne. Müller. Plate. Condition. circa 336 to 320 B. C. or later. On the following two varieties the head of Heracles faces to the left. Region of the Propontis . Similar to the preceding but of later style. circa 333 to 324 B. C.
circa 330 to 320, or later. No. Spec. In field. Beneath throne. Behind Zeus. Newell. Plate. Condition. Second Series, circa 327 to 324 B. C.
Third Series, circa 323 to 319 B. C.
No. Spec. In field. Beneath throne. Newell. Plate. Condition. Series I, circa 330 to 320 B. C.
Series II, after circa 320 B. C.
circa 332 to 320 B. C.
a) Inscribed: ΑΛΕΞΑΝΔΡΟ (sic!) ΒΑΣΙΛΕΩΣ. Series I, circa 330 to 325 B. C.
Series II, circa 325 to 320 B. C.
Series III, circa 320 and later. Series I, circa 328 B. C., or later. Series II, after circa 325 B. C.
Series I, circa 333 to 330 B. C.
Series II, circa 329 B. C.
Series III, circa 328 to 326 B. C.
Series IV, circa 326 to 323 B. C.
Series V, circa 323 to 320 B. C.
Series VI, circa 320 to 319 B. C.
Series I, circa 332 to 330 B. C.
Series II, to circa 319 B. C.
Series I, to circa 330 B. C.
Series II, to circa 328 B. C.
Series III, to circa 319 B. C.
Series I, in the name of Enylus. Series II, in the name of Adramelek. Series I, 332 and 331 B. C.
Series II, 331 to 327 B. C.
Series III, 327 to 323 B. C.
Series IV, 323 to 320 B. C.
Series V, 320 to 318 B. C.
Series II, circa 329 to 328 B. C.
Series III, circa 327 B. C.
Series IV, dated 326 to 321 B. C.
Series V, dated 320 to 318 B. C.
UNCERTAIN MINTS IN THE East. Series I, circa 331 to 329 B. C.
Series II, circa 329 to 326 B. C.
Series III, circa 326 to 324 B. C.
No. Spec. In field. Beneath throne. Muller. Plate. Condition. Series IV, circa 324 to 323 B. C.
No. Spec. In field. Beneath throne. Mŭller. Plate. Condition. The crescent is represented with its concave side to left, to right, or downwards. This variety differs from nos. 1597–1598 in having broader flans and exhibiting a slightly more advanced style. This monogram at times is inverted. Towards the close of this issue the ΑΛΕΞΑΝΔΡΟΥ and the ΒΑΣΙΛΕΩΣ are transposed and the latter appears in the exergue. Groups A to K, Nos. 1 to 1582 inclusive. 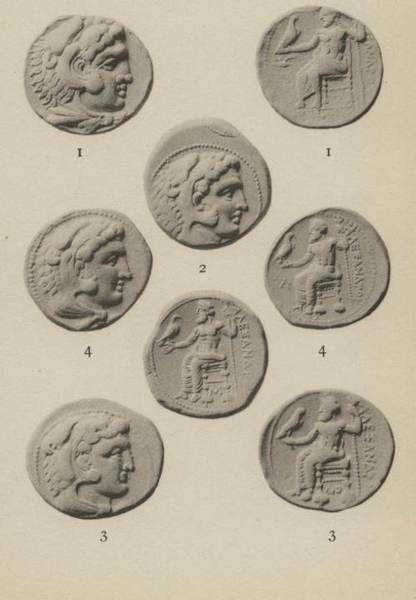 That the coins forming the above eleven groups belong together, and represent the issues of a single mint, has been demonstrated in the present writer’s “ Reattribution of Certain Tetradrachms of Alexander the Great ”. 6 As there pointed out, these coins all show one tradition of art and manufacture, and reveal a steady progression (one can hardly call it progress) in style. The individual members of each group are closely bound together, inter se, by the frequent use of a common obverse die; the larger groups, in their turn, are also linked together in the same manner. In other words, group 'A’ will possess certain dies that were used in its production and then were continued in use, in a slightly more worn condition, for group ‘B’ Group ‘B’, in turn, will be found to possess cer- tain obverse dies that had already been used for ‘A’, and others that were later used for ‘C’, and so forth. Since the publication of that study, a great many additional cases of such use in common of obverse dies between the component members of a single group, as well as between group and group, have turned up. These facts, taken together, prove beyond a doubt that these coins are all the issues of a single mint. Little change has been made in the actual grouping of the varieties and their sequence. This can be more or less accurately determined by noticing the interchange of dies, the development of style and technique, and the average amount of circulation exhibited by the various groups contained in such a hoard as that of Demanhur. Reasons of style, the find spots of corresponding subsidiary denominations, the close connection with and continuation of the monetary issues of the previous reign, and the re-issue of posthumous silver with types of Philip II, all prove that the mint which struck coins Nos. 1 to 1582 was situated within the boundaries of Macedonia. At the time the monograph above mentioned was written, the choice lay between Pella the capital and Amphipolis the largest port and the centre of the silver mining industries. The writer inclined towards Pella as the probable mint, but expressed the conviction that Amphipolis 7 could present as good a claim. However, a continued and detailed study of the numerous later coinages of the same mint appear to prove conclusively that it was located in Amphipolis and not in Pella. At present it is not advisable to enter upon a necessarily lengthy discussion of the pros and cons, since this would demand the study of hundreds of coins not in the Demanhur hoard and thus take us outside the limits originally set for this article. The dates previously proposed for these Macedonian issues by the writer, in his “Reattribution of Certain Tetradrachms of Alexander the Great,” must now be disregarded. At that time he followed the accepted authorities 8 in the interpretation of the dates found on the Ake issues. Further studies, 9 however, revealed the indisputable fact that these dates are in error by some fourteen years, and this discovery throws out all previous calculations concerning the dates of the contemporaneous Macedonian issues. In looking over the issues of the Amphipolis mint, as presented to us by the Demanhur hoard, we are naturally impressed by their quantity, continuity and evident importance as compared with the coinages of the remaining mints. In fact, they form at least one third of the entire hoard and outnumber the representatives of any other one mint. This is especially to be noticed as the accumulation was no doubt largely made in Egypt where it was eventually buried. The number of dies used at Amphipolis also surpasses that found for any other place at this period. It will be recognized, therefore, that Amphipolis must have been the most important mint of the entire empire, not only during Alexander’s lifetime, but also throughout the greater portion of his successor’s reign. Before closing our notes on the Amphipolis coinage, as represented in the Demanhur hoard, it is necessary to correct an error which crept into the writer’s previous list of the varieties coming to him from that find. The tetradrachm illustrated on Plate 17, No. 3, is now known never to have been in the find. By mistake it had found its way into the lot purchased from M. Bourgey by the writer and so was included by him in his catalogue. It was not until too late that his suspicions, aroused by the divergent appearance of the piece and its anomalous presence in such an early hoard, were confirmed by M. Bourgey. The coin had come to him at about the same time as the Demanhur pieces, but from another source. Groups A to F, Nos. 1583 to 1638 inclusive. These coins must also constitute the issues of a single mint, as many of their types are connected by identical obverse dies. We find several instances where an earlier reverse die has had its symbol or monogram partially erased (leaving sufficient traces, however, to enable us to determine the variety) and a later one substituted. There is, in addition, an unmistakeable continuity of style throughout the series. The mint itself must have been situated in Macedonia. Not only do the coins themselves show many affinities in style with the Amphipolis issues, but the accompanying subsidiary bronze coins are almost exclusively found in Macedonia or Thessaly. Certain posthumous staters, tetradrachms and smaller denominations of the Philip II type are known which bear the same monograms or symbols as our tetradrachms and show the same stylistic peculiarities. 12 It is obvious that the posthumous silver issues of the Philip type could only have been issued in Macedonia and, possibly, Thessaly. The demand for this type of coin was apparently confined to Macedonia, Greece, and the northern barbarians. The last named seem to have especially favored this type of coin and it was no doubt largely for their special benefit that these posthumous issues were made. There must also have been a certain continued demand for them in Hellas itself, for the posthumous types are well represented in the Lamia hoard (preserved in the Athens collection) and in two small hoards from Central Greece now in the writer’s possession. Others were contained in the Andritsaena (Peloponnesus) hoard, 13 the second Megara hoard, 14 and the Kililer hoard. 15 If then we are forced to assign Nos. 1583 to 1638 to some mint in Macedonia, only Pella can come into considera- tion, for Amphipolis has already been preempted by Nos. 1 to 1582. In comparing the issues of Amphipolis and Pella we see that the latter mint has by this time become of distinctly lesser importance than the former—which had not been the case under Philip II. At Pella under Alexander the issues themselves, the dies cut, and the actual coins struck, are comparatively few. This is also reflected in the fact that at Pella only one annual magistrate, as a rule, supervises the coinage. At Amphipolis it is evident that many magistrates must have functioned at one and the same time. Probably because of the contrast in their respective situations the Pella mint now came to be used more for supplying local demands, the Amphipolis mint for foreign commerce. It is a fact that while the writer has records of the latter’s issues being strongly represented in hoards from European Greece, Asia Minor, Egypt, Syria, Babylonia, and Persia, the Pella coins seldom turn up in finds made outside of Europe, and then only in small numbers. In the European hoards, however, they are not uncommon. It is furthermore to be noted that such specimens of the Pella mint as did occur at Demanhur are all beautifully preserved, the majority hardly circulated at all. It is evident that they had not travelled much from hand to hand after leaving their dies. In contrast to this, considerable numbers of the Amphipolis pieces, particularly of the earlier issues, must by their appearance have circulated a good deal before they were finally consigned to the ground. Nos. 1639 to 1648 inclusive. If the coins of this type were not actually struck at Pella, they were at least copied from certain issues of that mint. To be particularly noted is the peculiar form taken by the back of the throne, a type that is found in use on the Pella coinage only. If, on the one hand, these particular tetradrachms, because of certain other peculiarities, will not fit easily into the Pella series as we know it, on the other hand they could not have been struck far away. Their late style, as well as the fact that all the known specimens from the Demanhur hoard were in fine condition makes it probable that they were issued about the time of Alexander’s death, or slightly later. It is quite possible that they were coined by Antipater, when in 322 B. C. he was shut up with his army in Lamia. The probable date of their appearance, their comparative crudeness of style and execution, and the fact that they imitated the Pella issues, makes this suggestion at least worthy of consideration. Nos. 1649 to 1675 inclusive. In the Revue Numismatique for 1904, pp. 117-133, M. Babelon proposed the attribution of the first of the above types to Sicyon, because of the rapprochement he there makes between the youthful figure with outstretched arms and the later, and better known, representation 16 of the youth holding a long fillet in his upraised hands. This figure M. Babelon calls “ Le devin de Sicyone". 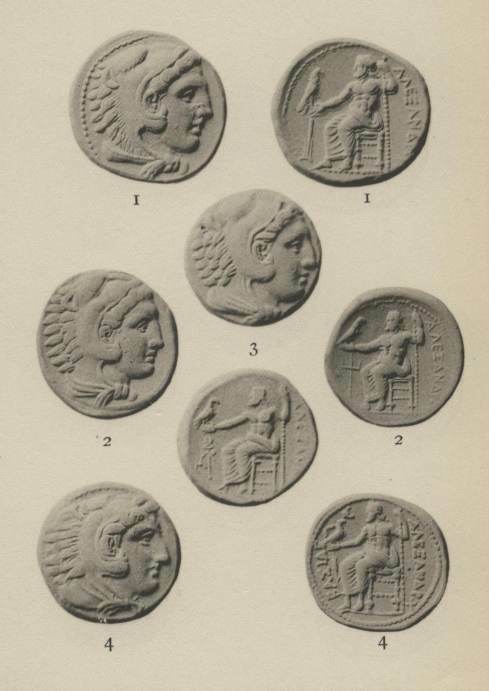 At the time of his previous article on the Demanhur hoard, the writer was unaware of M. Babelon’s attribution of these particular coins to Sicyon, and saw in them only the issues of some uncertain mint in Macedonia or Thrace. Since then many new and unpublished types not in our hoard have come to light. They form a numismatic bridge between the earlier pieces with the “ Sicyonian divinity ” symbol and the later coins (Müller, Nos. 864893) undoubtedly struck at Sicyon. As it is here permissible to deal only with such varieties as actually occurred in the Demanhur deposit, a study of the extremely interesting Alexander issues of Sicyon as a whole will have to be deferred to some future time. Among the most important and interesting of the coins that prove the correctness of M. Babelon’s attribution is No. 3. Plate II. A close inspection will reveal that what at first seems only a flaw in the reverse die, immediately beneath the outstretched arms of the little figure in the field, is in reality a flying dove somewhat minutely engraved. This definitely forms the link, hitherto missing, between the earliest and the later representations of the “ Sicyonian divinity ”, on the Alexander coinages. Thus we see the young god standing, with arms outstretched, both with and without the dove (Nos. 1 and 2, Plate 16), just as on the later Alexander issues of Sicyon he is standing holding a long fillet with his upraised hands. Here, too, the dove is sometimes present and sometimes absent. 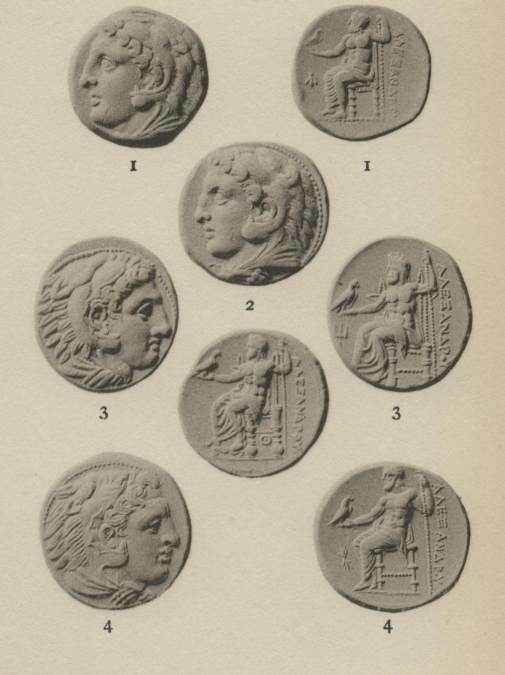 Certain autonomous bronze coins show him as on our coins of the Demanhur find, his arms stretched out in front of him as if to seize the bird, which, however, in this case too, is not always represented (see Babelon, l. c., p. 123, Nos. 11 and 12). Although not aware of the existence of a specimen like our No. 1649, M. Babelon yet describes the little figure on this type as in the act of stretching out his arms “ inspiré ” as he says, “ par le désire de saisir la colombe, bien que l'oiseau ne soit pas figuré. Il fait le geste de vouloir atteindre l'oiseau qui lui échappe et prend son vol.” (l. c., p. 124.) Now a specimen of this very type has come to light which actually depicts the escaping dove, and so proves M. Babelon quite right in his interesting surmise. The somewhat surprising position of this dove —beneath instead of above the god’s arms where one might naturally expect to find the bird after which he is grasping — can perhaps best be explained as an artistic convention. Either the field of the coin was felt to be too limited to place the dove in front of the hands (the more natural position) or we have here to do with a direct copy of some well known statue embodying these peculiarities. In a statue, particularly one of marble, it would indeed be somewhat difficult to represent a bird flying unsupported in front of the outstretched hands of the god. It might, however, be represented as escaping from between the arms, in which case these could be made to support the flying bird. The coin engraver, seriously handicapped by the limited space at his command and the insuperable difficulties of a very small basrelief, would be forced to give us a representation of the statue as we see it on our coin. The result was evidently felt not to be a success and the dove appears on one die only. The remaining types here assigned to Sicyon were very poorly represented in the Demanhur hoard and so, perhaps, do not clearly reveal their connection with the later coins correctly given to Sicyon by Müller. In fact, there are too many gaps here to make a lengthy discussion practical or even advisable on this occasion. If the contents of the Demanhur hoard thus give us a rather sketchy view of the sequence of the earlier Alexander issues of Sicyon, at least enough is available to prove that the Sicyonian mint must have enjoyed a certain amount of importance under Alexander and his successor Philip III. During the campaigns in Asia the Peloponnesus formed an important and prolific recruiting ground for the armies. Many mercenaries were recruited from among the mountaineers of this rugged peninsula, no doubt lured into the service by the dazzling prospects held out to them of the fabulous riches of the East so easily falling into the hands of Alexander’s armies. The famous recruiting ground of Taenarum was, in fact, situated not so far away. An active mint, more conveniently located than those in distant Macedonia, was certainly needed to supply the new recruits with the first installments of their pay and also to start them on their long voyage eastwards. It must furthermore be remembered that strong Macedonian forces were kept in the Peloponnesus during the war with the Spartan king Agis, and afterwards also, to discourage similar attempts at raising the standard of revolt in Alexander’s rear among the ever rebellious Greeks. This consideration amply accounts for an active mint at Sicyon. Nos. 1676 to 1747 inclusive. The mints at which these coins were struck were probably no less than three in number. As shown by the great stylistic similarity of their issues, these particular mints must have been situated close to each other or were, at least, intimately bound together by ties of commerce. It is not the writer’s intention to discuss their coinages here. The tetradrachms before us fail to give any adequate idea of the large series of coins issued by them. These series are almost entirely composed of Alexander and posthumous Philip II staters, accompanied by unusually extensive issues of drachms bearing the names and types of Alexander III and Philip III. The coinage of tetradrachms was both scanty and intermittent. We would therefore be forced to transgress the bounds set for this article if we were to discuss the issues of these mints in an at all adequate manner. Because of their style, the symbols employed, and the find-spots of single specimens of the accompanying drachms, Nos. 1676-1747 may in general be assigned to the regions bordering the Propontis. This embraces both the European and Asiatic shores. Nos. 1687-1747 Müller has already given to Perinthus in Thrace. Possibly he is correct in such an attribution, though the present writer would most certainly prefer to assign this large issue to the city of Lampsacus on the opposite shore. Now there is no question but that to Alexander the province of Hellespontine Phrygia constituted a vitally important portion of his empire, as through it ran the highway connecting him with his home base in Macedonia. It must therefore have been very strongly garrisoned. Entirely aside from its strategic importance to the fast growing Macedonian Empire it was, and always had been, commercially most important and, therefore, very wealthy. Together with the Thracian Chersonese it commanded the famous waterway between the Aegæan and the Black Sea. The lands around the latter were, and had long been, the granary of Greece, and so through the Hellespont ran the life lines of Hellas. This portion of Asia Minor had for centuries possessed mints noted for their large and continuous coinage. Under Alexander the cities that still were allowed to retain their full autonomy continued to coin extensively, using their accustomed types. Among these were Cyzicus, Heraclea, Chalcedon, Cius, Pergamum, and many others. The seat of the Persian government in these regions had been Dascylium, but we know of no Persian coinage having been struck there. Instead, the Persian satraps seem to have employed the convenient and already existing mints of Cyzicus and Lampsacus whenever they had occasion to issue money of their own. It is to this fact that we owe not only the many Persian types found on the electrum staters of Cyzicus and the gold staters of Lampsacus, but also the definitely and purely Persian coins evidently issued from time to time by these mints for satrapal pur- poses 17 . There can be no question but that Cyzicus and Lampsacus were the most important coining centres in all this territory. Cyzicus, however, continued to issue money in her own name and with her own types for some considerable time after the actual arrival of Alexander the Great. 18 We have therefore no reason to expect or to look for an Alexander coinage in that city—particularly as Cyzicus very jealously guarded her cherished autonomy throughout these stirring times. Lampsacus seems to have fared differently. A study of her autonomous coinage reveals a great stylistic gap which cannot have commenced long after 335 B. C. and apparently extends to about 200 B. C. It is known that Lampsacus remained an important commercial centre throughout this period, and the apparent absence of any coinage is therefore highly significant. She had previously struck coins for Persian satraps, even going so far as to place some of their names (those of Orontes and Spithridates 19 ) upon them. There is every reason to believe, therefore, that here would be located one of Alexander’s important mints. This follows not only from the fact of the city’s strategic and commercially important situation, but also from the fact that she had recently possessed a large and active mint and had actually coined for Persian satraps. In proceeding with our study of Alexander’s other eastern coinages we shall soon come to see how significant these particular points really are. It will be possible to show, again and again, that certain central mints especially active just previous to Alexander’s arrival were nearly always continued—for economy’s sake and because that very activity presupposes some definite commercial, political, or strategic importance—under the new régime. In other words, Alexander practically took over bodily the practices as well as the government and the provinces of the Persian Empire. The series at present being discussed has therefore been assigned to Lampsacus on purely external grounds. Internal evidences are not strongly conclusive, but, such as they are, would seem to corroborate the attribution. The series, with its unusually extensive accompaniment of staters (Alexander and posthumous Philip types) and Alexander and Philip III drachms, is by far the largest and most important in all north-western Asia Minor. These gold issues are unusually prolific, as is only to be expected from a city which had been coining gold staters of her own in such abundance for so many years. One of the most frequently recurring symbols on the staters and drachms is the forepart of a winged horse, the peculiar emblem of Lampsacus. Second only to this in frequency of occurrence is a figure of Artemis, one of the principal and most popular divinities of the city. As stated above, Nos. 1687-1747 had previously been assigned by Müller to Perinthus because of the curious double-horse symbol which occurs on the accompanying staters and is also found used as a type on the autonomous issues of that city. But these are evidently only magistrates’ symbols, and only one of them has any peculiar connection with Perin- thus. We have to be on our guard against basing an attribution on the strength of a single magistrate’s symbol. Furthermore, the symbol of the joined foreparts of a horse is not exclusively Perinthian. The Alexander tetradrachms described by Müller under his No. 393 were, by their style, certainly struck beyond the Taurus. Besides, Perinthus at this time was semi-autonomous and we have no reason to look for an Alexander coinage here at such an early period. Circa 333-324 B. C., Nos. 1748-1750. Here, too, we can gain no really adequate idea of the importance of this series to which the above three scarce types belong. Although scores of varieties of the drachm and the gold stater go to make up this series, the tetradrachm was seldom struck at first and then only in comparatively small numbers. Among the gold staters accompanying this group there is but one which bears the name and types of Philip II. This shows clearly that the present mint must have been somewhat removed from the wide-spread influence of those famous coins. Only sporadic instances 20 occur of these posthumous issues of Philip II having been coined outside of Macedonia, Thrace, and the lands bordering the Hellespont. their longest axes to correspond with the longest axis of the coin blank. For this reason we will always find the dies of the Croesic staters and sigli adjusted ↑ ← or ↑ → as in Fig. 1. After the fall of the Lydian Empire the Persian kings substituted their darics and sigli for the Lydian coins, and the royal archer of Persia replaces the Lydian lion and bull. But now that the composition of the new type is roughly □, the reverse punch, being oblong in shape, must take an upright position because the oval coin blanks are still retained. Again the two dies necessarily assume positions to correspond with each other and the longer axis of the blank, as in Fig. 2. So long as the Persian Empire lasted, the obverse die and the reverse punch mark on the royal coinage held the constant relation forced into this rigid position by the peculiar form of the blank. It is most probable, therefore, that in imitation of the royal issues the practice of adjusting dies, particularly in the most usual position ↑ ↑, became so prevalent in the East at a comparatively early period — long before the mints of the Greek world adopted it. As the coins described under Nos. 1748-1750 are so adjusted, it is reasonable to suppose that they originated in a mint under Persian influence. Their style, however, and that of the accompanying staters and drachms proves that they must have been struck in Asia Minor, that is, north and west of the Taurus range. There is only one mint in this region that entirely conforms with the requirements demanded, and that one is Sardis. In the first place, there had for centuries been situated at Sardis a royal mint, first under the Lydian monarchs until the death of Croesus, then under the Achæmenid 21 sovereigns. Under the latter, Sardis constituted the seat of government for the very important First Satrapy while its governor was practically viceroy for the entire western portion of the Empire. It is highly probable that the darics and sigli coined here lasted until the coming of Alexander. The latter, on his arrival, took over the city and, fol- lowing the Persian precedent according to his almost invariable custom, retained Sardis as the capital of the Lydian Satrapy. Now in all this satrapy only Sardis is at all likely to have coined under Alexander. It was the only large and important city of this district that did not possess complete autonomy. It had been a royal mint for centuries and had coined actively under the preceding régime. The remaining large commercial centres of the region, such as Ephesus, Clazomenæ, Erythræ, etc., were autonomous Greek cities and enjoyed and jealously guarded the coveted privilege of striking autonomous coins. Alexander looked upon these Hellenic centres of trade and commerce as allies, and, like the Persian kings before him, refrained from infringing upon their rights of local coinage. Sardis, however, was in a different category because as a city it had never enjoyed the rights of autonomous coinage, being the seat and royal capital of the satrapal government. Here Alexander undoubtedly found an active mint of long standing, and furnished with all necessary appliances and workmen. In Sardis we, for the first time, touch upon an outpost of oriental civilization and apparently find immediate evidence of this in the adjustment of coin dies. As the coinages of Lampsacus and adjacent mints were intended to supply the needs of Hellespontine Phrygia and of the garrisons which were stationed there, so the coinage of Sardis was to supply the royal needs in the important satrapy of Lydia, and especially to provide the pay of the troops stationed here to protect the famous “ Royal Road ” which ran via Sardis to the East. Circa 330-318 B. C., Nos. 1751-1818. At the time of Alexander’s invasion there was residing at the castle of Alinda, Ada the sister and wife of Idrieus the former satrap. She had been deposed by Pixodarus when the latter had seized the power on the death of Idrieus. Ada at once opened negotiations with Alexander, even going so far as to adopt him formally as her son. She also offered to assist him in every way to secure the province of Caria, asserting that many of the nobles, as well as the Greek cities, would declare for him. Little wonder then that, after the capture and destruction of Halicarnassus, Alexander should have entrusted the satrapy to Ada. Its revenues were also assigned to her, and a force of 3,000 infantry and 200 cavalry under a certain Ptolemaeus was left to protect the land. This important and wealthy district, as under the Persians, was allowed to coin money —but henceforth only with Alexandrine types. As the capital, Halicarnassus, had been completely razed 25 the mint was naturally transferred to the nearby city of Miletus, the largest, and commercially the most important, place in all the region. These coins are members of one group and therefore the issues of one mint, as is definitely shown by the fact that all the varieties here given are bound together by the use of certain identical obverse dies. It is somewhat difficult, however, to assign the group to any one mint or even province. The style as exhibited, particularly by Nos. 1819 to 1943, is clearly that of Greek artists in Asia Minor. The reverses of Nos. 1944 to 1972 are evidently somewhat influenced by the contemporary issues of Tarsus (Nos. 2327-2369). But this does not mean necessarily that their mint must be looked for in Cilicia. Alexander’s issues in Tarsus were discussed by the writer in a recent number of the American Journal of Numismatics. 26 There it was shown that because Soli, Mallus, and Issus had to have their municipal coins struck for them in the central mint of Tarsus, it was not at all likely that they possessed mints of their own during the lifetime of Alexander, or even immediately after. The only other cities in Cilicia that had coined extensively in Persian times were Celenderis and Nagidus. If they coined under Alexander, their issues could scarcely have been of such importance as those represented by Nos. 1819 to 1973 manifestly are. Furthermore, their issues, like those of Cyprus or Phoenicia, would have been of a somewhat local character and so would have borne mintmarks of greater local significance. 27 Neither Celenderis or Nagidus can be looked upon as possible imperial mints. Nor was there any need in Cilicia for further issues of this character, as it is evident that Tarsus acted as the central mint for the entire province and as such issued imperial money in all necessary quantities. Nos. 1819-1973 are clearly royal issues as they bear no mintmarks of local significance, merely the private signatures of magistrates in charge of the coinage. It is probable that their mint was located in some seaport or important commercial centre. This follows from the fact that specimens of these varieties are present in nearly every recorded Alexander hoard buried previous to 300 B.C. They have occurred in at least six Egyptian hoards (including the present one), one Babylonian, one Syrian, one from Central Asia Minor, four Greek, and one Macedonian. Single specimens have reached the writer at various times from nearly every quarter of the Near East, from Athens, Constantinople, Smyrna, Syria, and Egypt. Coins of this type were apparently very widely scattered in ancient times. This would lead one to suppose that they had originated in some active centre of commerce and trade, preferably a seaport. This is indeed negative reasoning and so is only of real value as a corroborative piece of evidence. On the whole, then, it might be said that the evidence points to some mint where “ royal ”, as in distinction to “ municipal ”, Alexander coins would be struck, and this at some important seaport in Asia Minor, not too far distant from Tarsus. Approaching the problem from another angle, we have already noticed that the great Asiatic provinces of Hellespontine Phrygia, Lydia, and Caria, were severally supplied by an adequate coinage of the new types from their central mints. Cilicia, too, was amply provided for, as the writer has tried to bring out in his recent monograph on the subject. In this portion of the world there remain only the three great provinces of Greater Phrygia (assigned to Antigonus), Lycia and Pisidia (together with Pamphylia constituted as one province and assigned to Nearchus), and finally Cappadocia (assigned to Sabactes as satrap). Cappadocia is at once ruled out as it was somewhat out of the direct line of trade, was not as important a portion of the empire as the other provinces, and did not become a particularly active coining centre until much later times. Celaenae, as the garrison centre of Greater Phrygia and situated on the main road from Cilicia and the East to Sardis and the West, might well lay a considerable claim to the possession of an important mint. By means of the commerce which undoubtedly flowed along this route, the die cutters of Celaenae would very likely be well acquainted with the coin issues of Tarsus and might soon be led to borrow certain details from them. However, Celaenae, so far as we know, never possessed a mint in Persian times. Alexander found it more expedient to issue his new coinage from old and well constituted mints, to which apparent rule there are only two exceptions, both of obvious explanation. The one is Ake, which was opened to take the place of Tyre destroyed; the other was the mint in his new foundation of Alexandria, a city he planned as a great capital and so, obviously, in need of a suitable mint. There only remains the important province formed from the united districts of Lycia, Pamphylia, and Pisidia. Along the coast of this province were located the busy seaports of Phaselis and Side, while further inland lay the powerful cities of Aspendus and Selge. All of these towns had struck coins in greater or lesser quantities before the coming of Alexander’s army. However, neither Selge nor Aspendus need be taken into consideration when searching for the possible mint of our tetradrachms. Selge was not of sufficient importance at this time, while Aspendus was attacked, severely punished, and suppressed 28 for its hostility to Alexander. Only Phaselis and Side therefore remain. Both these cities were very closely bound by coasting trade with Cilicia. They were active, wealthy, and well populated at the time of which we are speaking. The mountains behind them possessed rich silver mines, and Side’s mint, in particular, had long made full use of them. Nearchus apparently chose Phaselis as his seat of government, 29 and on this score that place could lay claim to an issue of coins such as ours. Side, on the other hand, was perhaps a more active centre of trade and commerce, and her issues of autono- mous coins had been the more continuous throughout Persian times and down until the coming of the Greeks. 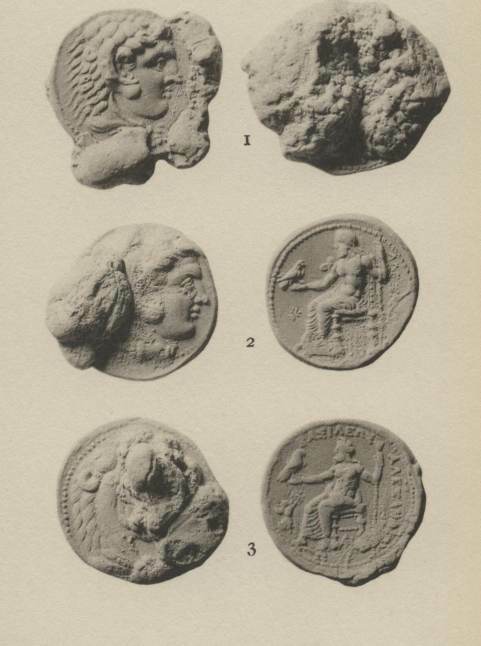 There is no doubt but that her business ties with Cilicia were strong, her coins had followed the same weight standard and were in appearance very similar to those of Cilicia. What is more, several were actually present in the Cilician find described by the writer a few years ago. 30 Furthermore, her ties with Egypt must have been close as her coins are often found there. 31 This would account for the surprising frequency with which coins of the type of Nos. 1819-1973 occur in Egyptian finds. The style of our pieces and the presence of the title point to a period after about 326 B. C. for their striking. This being the case, the tetradrachm in the Hunterian Collection, at Glasgow, first published by Dr. Macdonald and illustrated on Plate XXII, No. 3 of his catalogue, was probably the earliest issue of the Alexander type at Side. So far as the writer is aware, this piece is still unique and was not represented in the Demanhur deposit. 333 to circa 320 B. C., Nos. 1974-2435. Tarsus, the capital and metropolis of Cilicia, had from very early times been the most prolific mint of this great province, so rich in natural resources and strategically so important to the empire of which it formed a part. The Persian forces stationed here had retreated before Alexander’s victorious advance and the city fell without a blow. The new ruler followed the obvious and most expedient course by imitating the Persians in making Tarsus his principal mint for this district. He employed the same workmen, and issued a large 32 series of coins comprising gold staters, silver tetradrachms, numerous subdivisions in silver and copper, and, last but not least, two re-issues of the old Persian staters. It is, however, only the tetradrachms that interest us here as they alone occurred in the Demanhur deposit. The first issue is made up of two separate but con- temporaneous groups of coins, the one distinguished by an ‘A’ beneath the throne, the other by a ‘B'. Special control marks are supplied by pellets, singly or in groups, placed beneath the throne or in the field behind the Zeus figure. A few of the obverse dies were used indiscriminately for both groups. There are also several instances where a reverse die of either series has been employed for the other, after the old letter had been erased and a new one substituted. The second series is more uniform, and is distinguished throughout by a PLOW, perhaps symbolical of the far-famed fertility of the Tarsian plain. As special marks of control we find the pellets of the previous issue again used, and, in addition the letters, Β, Γ, Θ, and the symbols IVY LEAF and BUNCH OF GRAPES. The distinguishing mark of the third issue is a wreath-bearing NIKE. She is accompanied by varying letters and monograms, and, towards the end, by a CADUCEUS. In the course of this series the old “Cilician” style, made so familiar to us by the large issues of Persic staters bearing the names of Phamabazus, Datames, and Mazaeus, is definitely abandoned, and a new style, purely Greek in character, is introduced. Circa 332 to 320 B. C. Nos. 2436-2544. The reasons for assigning these particular coins to Salamis in Cyprus have already been discussed in “Some Cypriote Alexanders” Num. Chron., 4th Ser., vol. XV, 1915. The Salaminian tetradrachm issues contained in our hoard comprise both types of Series I, but only the first type of Series II as there described. In discussing these coins on that occasion, the writer hesitated to see in the BOW a city mint mark, such as the other cities of Cyprus were using at this period. On reviewing this subject the possible suggestion has occurred to him that perhaps the BOW might rather be the personal symbol of Nicocreon, king of Salamis from 331-310 B. C. It is to be noted that Nicocreon was the first to introduce the type of Apollo on the Salaminian coinage of local types and Rhodian weights. 33 These coins were issued more or less simultaneously with those bearing the Alexander type. The fact of the introduction of an Apollo type by this king would lead to the supposition that Apollo probably represented his patron god. The use of the king’s personal symbol on an Alexander issue, rather than a monogram or symbol designating the city itself, is paralleled on the Alexander issues of Byblus in Phoenicia. This city, which by the way was situated on the mainland opposite Salamis and was bound to it by ties of commerce, marked its earliest Alexander issues with the initial letters of its ruler’s name. Our Salaminian coins are. struck from dies adjusted ↑. Circa 332-320 B. C. Nos. 2545-2666. This series, too, was discussed by the writer in the above mentioned article in the Numismatic Chronicle for 1915. The comparatively large number of this particular group of Cypriote Alexanders in the Demanhur find, points not only to the large size of the issue itself, but also to the probability of close commercial relations existing at that time between Cyprus and Egypt. In fact, specimens from the Cypriote mints have occurred in every hoard known to the writer as having been found in Egypt. Circa 330 to 320 B. C. Nos. 2667-2682. No. 2667 (Plate V, 4) has been assigned to Paphos because of the symbol which appears to be intended to represent a dove rather than an eagle, as Müller believes. The style of the coin itself is distinctly “eastern”, its peculiarities, however, make its attribution to Cyprus more plausible than to any city in Cilicia, Syria, or Phoenicia. Circa 328 or later. Nos. 2683-2714. The tetradrachm No. 2683 (Plate VI, 1) has been transferred from Paphos (where Mr. Hill assigned it in the British Museum Catalogue of the coins of Cyprus) and given, instead, to Amathus. In the first place, the flying eagle (not dove), exactly as we see it on this coin, constantly appears on the autonomous coins of Amathus. On autonomous Paphian issues the dove is never depicted in the attitude of flight. In the second place, this coin is quite unlike the remaining Alexander issues of Paphos, while its reverse has many points in common with Nos. 2684-2714. This similarity is to be seen particularly in the details of the Zeus figure. Nos. 2684-2714, distinguished by the symbol PROW, are typically eastern in style. The details of this style, however, point to Cyprus as the home of the mint which struck the coins. They will not satisfactorily fit in with the issues of Cilicia, Syria, Phoenicia, or Egypt—but partake of a little of the style of each. Furthermore, we have at our disposal no seaport town in any of these particular provinces which is either without a coinage already assigned to it, or which could have struck so large a series as the present issue apparently is. The fact that specimens occur in at least three out of the six hoards found in Egypt, of which we have records, speaks well for a Cypriote origin. For between that island and Egypt the ties of commerce and trade were closely knit. Particularly would this be the case with the two harbors on the southern coast of Cyprus— Curium and Amathus—to which no Alexander coinage has as yet been assigned. We know also that during the Persian period the mint at Amathus was very active and struck a large series of silver coins. 36 It is most reasonable to suppose therefore, that like its sister cities of Cyprus, Amathus should have continued to strike money under Alexander. There is no series of Alexander tetradrachms at our disposal whose origin is more likely to have been at Amathus than the group distinguished by the PROW symbol. We have also a tetradrachm (No. 2683) which bears the flying eagle peculiar to these autonomous issues of Amathus, and is therefore most likely to have been struck in that city. This piece forms the connecting link between the autonomous coinage and Nos. 2684-2714 with the PROW symbol. The reasons for attributing this variety to Marium in Cyprus have been discussed in the writer’s “Some Cypriote Alexanders ” in the Num. Chron., 4th Series, vol. XV, pp. 320, 321. These three tetradrachms are here only tentatively assigned to Cyprus. The style, which appears to be copied from some of the Egyptian issues, is not impossible for Cyprus. The symbol CADUCEUS is perhaps not unconnected with the little Cypriote bronze coin, of late style and bearing on its reverse a caduceus flanked by the Cypriote signs for Bα — E. The unique specimen of this piece was first published by the writer in the Amer. Jour, of Num., vol. XLVIII, p. 69, No. 31. There the suggestion was made that this coin should be attributed to Eunostus, king of Soli, who reigned from 330 to 310 B. C. It is not unlikely that our Alexander tetradrachms were also struck by that king and signed with his symbol, the Caduceus. This would be paralleled by the use of the Bow on the Salaminian Alexanders of Nicocreon. Circa 333 to 319 B. C. Nos. 2719-2896. This series, by its style, is more or less closely associated with the Cilician group (mint: Tarsus) described above. That it could not possibly have been struck by some city in Cilicia but must instead be assigned to Myriandrus (later Alexandria ad Issum) has recently been shown by the writer in Amer. Jour, of Num., vol. LIII, Part II, pp. 1-42. The reasons for this attribution are there given in detail. The various series into which the Alexander issues of Myriandrus fall, and the dates to be assigned to them, are likewise there described. Myriandrus, by reason of its commanding situation, had grown to be commercially the most important city in all northern Syria. Possessed of a splendid harbor, the roomiest and best protected on the coast, the city became the terminus of the great trade route, via the Beilan Pass, into the plains of inner Syria. She completely dominated the shortest and most practical road linking the Mediterranean with Syria, Mesopotamia, Babylonia and the East. In fact, before Antioch and Seleucia on the Orontes had come to supercede her as the main outlet for the overland trade from Babylon and India, Myriandrus enjoyed an importance relatively far greater than Alexandretta, her representative in the Middle Ages and down to the opening of the Suez Canal. We may thus appreciate this north Syrian seaport at its true worth as the western terminus of the most frequented trade-route and military highway from Babylonia to the Mediterranean. Alexander’s farsighted statesmanship immediately recognized the vital importance of the spot. This fact is indicated in no uncertain way by the foundation here of a city named after him, Alexandria kat’Isson — one of the very first of the many strategic or commercial centres established by him, and also one of the two which today preserve his illustrious name intact. It is not surprising to find that the preceding Persian mint located in this important city continued its activity under Alexander and issued a very large series of his coins. These are well represented in the Demanhur hoard. The proposed assignment of this coin (Plate VI, 2) is still open to doubt. Its style closely resembles that found on the issues of Tarsus, Myriandrus, and some of the Phoenician cities, yet is still too individual to allow its insertion among the coinages of any of these mints. The actual cutting of the dies is also somewhat cruder. Now we know 37 that a considerable issue of Persic silver staters took place in the very important religious and commercial centre of Bambyce in the period that im- mediately preceded and immediately succeeded the arrival of Alexander the Great. These issues, too, are in imitation of the contemporaneous coinages of both Tarsus and Myriandrus, and their execution is crude to the same degree as that of our tetradrachm, No. 2897. Furthermore, on the last issue of these local staters, on a com 38 actually bearing the name of Alexander in Aramaic characters, appears as magistrate’s sign the Greek letter M. This coin is perhaps the transitional piece between the local coinages of Persic silver staters and the introduction of the Alexander tetradrachm. At any rate, there is no other locality in all the eastern district to which this lone tetradrachm fits so well as to Hierapolis-Bambyce. Its possible attribution to that important city is therefore suggested here. The abundant Alexander coinage of this famous Syrian metropolis is naturally well represented in the Demanhur hoard. Mistress of the great inner highway running north and south, inland emporium for the surrounding lands and the neighboring desert tribes, commercial intermediary between these tribes and the trading centres of the Phoenician litoral, the coinage of Damascus was, in the very nature of things, one of the most important in these regions. At the time our hoard was buried the decay, which later set in with the founding and rapid growth of Alexandria in Egypt, had not yet made itself perceptibly felt. The commerce enjoyed by Damascus was evidently active and in consequence her coinage was large. A detailed study of the issues represented by Nos. 2898 to 3266 show that these really fall into several consecutive series. The present hardly furnishes a suitable opportunity for such a study, and therefore the separate issues have here been united under one large series covering about twelve years of time. The dies for this large coinage were invariably adjusted ↑ ↑. If then the ancient city of Came claimed independence when Alexander arrived in Phoenicia, it is likely that she imitated her larger neighbor and struck coins of the Alexander type. Because of her lesser importance the series is probably small. The group of tetradrachms represented by Nos. 3267 and 3268 would admirably suit a mint at Came. The obverse of the first coin represents many stylistic affinities with Nos. 3269-3285, the first Alexandrine issue at Aradus. Details of the reverse, however, such as the position of Zeus’ feet, coupled with the total absence of any footstool, resemble the issues of Salamis in Cyprus. Now the important seaport of Salamis lay directly opposite to Came and was no doubt connected with it by ties of commerce. The next issue, No. 3268, is an almost exact copy of the contemporaneous coinage at Aradus (Nos. 3334-3466) in the details of both obverse and reverse. These coins must surely have been struck at a town not far from Aradus, or at least directly under the influence of its coinage. Finally, the monogram with which our coins are provided most easily resolves itself into KAP. It is to be noted that the alpha of the monogram does not possess the straight bar necessary for this letter at so early a date. The cross-bar is distinctly curved, which would thus almost certainly presuppose the presence of the letter rho in the monogram. Like the other cities of Phoenicia and Cyprus at this time, then, it seems probable that Came commenced an issue of Alexander tetradrachms. Like them it was also allowed to mark its issues with a monogram of local significance. Among the earliest Alexander issues of Aradus must be placed a very rare coin, published 40 by M. Babelon, which apparently was not present in the Demanhur find. This is a tetradrachm bearing in the field of the reverse the Phoenician letters מא. This same inscription occurs on all the fourth century autonomous issues of Aradus. Similar to this tetradrachm in style are our Nos. 3269-3285, but on these the Phoenician letters of the mint’s name are replaced by the Greek letter ‘A’ beneath the throne. The Γ in the field is a magistrate’s letter. On the succeeding issues we find the magistrates signing their initials on the obverse (just behind the neck of the Heracles head), while the ‘A’ has been elaborated into the monogram more distinctive of the Aradian mint. In passing, attention should be called to an interesting gold stater, first published by Gesenius 41 and later by Wiczay 42 and Sestini, 43 examples of which are to be seen in the Paris, London, and Berlin collections. This stater embodies the peculiarities of two of the above tetradrachm issues. Behind the head of Athene we find the letter ‘Δ’ as on Nos. 3286-3288. On the reverse we not only find the monogram of those tetradrachms, but also the accustomed legend מא of the Aradian autonomous issues. Would that their mints had been so clearly indicated on all of Alexander’s coinages! With No. 3302 the style of the Aradian issues changes perceptibly, the title ΒΑΣΙΛΕΩΕ is added, but the mint mark remains. The sequence of these particular issues was discussed more or less minutely in the Amer. Jour, of Num., vol. XLVI, 1912, pp. 42-44. We will therefore refrain from again going over the ground, and need only pause to reiterate, more strongly than ever, that the letters A, Δ, ι, Ι, Λ, and Σ found singly in the reverse fields, should not be considered as alphabetical dates. 44 They are probably initials used by the various magistrates. The magistrate using the symbol CADUCEUS was the latest of the group, being in office just before the name of Philip III was substituted for that of Alexander on the Aradian coinage. Apparently no specimens of these later issues, struck in the name of Philip, were present in the Demanhur hoard. None of the Aradian coins we have here described seem to have been struck from fixed or adjusted dies, a process so freely used at this time in the other Phoenician mints. Alexander issues corresponding to Nos. 3586-3652 have always, until now, been assigned to Aradus. In his previous article on the Demanhur hoard, the writer followed his predecessors, but stated 45 that it was difficult to reconcile the style and appearance of these pieces with the issues (Nos. 3286-3585) which certainly belonged to Aradus. It was therefore necessary to make the very improbable suggestion that these two series might both have been struck in Aradus, but that perhaps the one was a local city issue, the other a military or regal issue. Very fortunately the Demanhur hoard is now known to have contained a tetradrachm, hitherto unpublished, which presents a solution to the problem. This is the remarkable piece, No. 3586, pictured on Plate VI, 3. The coin is of early date, and of Phoenician origin as shown by the two Phoenician characters עי beneath the throne. Its style and fabric is so close to the earliest issues of Nos. 3587-3623 that it must be considered as the immediate precursor of those pieces and struck in the same mint. This means, however, that the entire group could not possibly have been struck in Aradus. This conclusion is further substantiated by the fact that our coins are invariably struck from adjusted dies, and we have already seen that this is not the case with the issues certainly emanating from the mint of Aradus. Nos. 3587-3623 are of modified ‘Cilician’ style, very similar, as a comparison will quickly show, to the earliest issues of Sidon and Ake. Now there is only one remaining mint in all this district which could possibly have struck such an important series as the one represented by Nos. 3586-3652. This is the ancient and flourishing city of Byblus. It would have been surprising indeed if this city had not struck money in Alexander’s name. History teaches us that Alexander made it his constant policy in the East to confirm in their rule such local princes as submitted to him without a struggle. Also a study of his coins presents us with the undeniable fact that wherever such local dynasts had, under Persian rule, enjoyed the rights of coinage, these were reaffirmed to them by their new over-lord. Thus we possess Alexander issues of Tarsus, Aradus, Sidon, Salamis, Citium, Paphos, Marium, and Amathus. Tyre and Gaza form illuminating exceptions. Although they had enjoyed the rights of coinage under the Persians, they were deprived of this coveted privilege by Alexander because they had refused him submission. If by a process of elimination we see that only Byblus could have issued Nos. 3586-3652, we find a striking confirmation of this attribution in the presence on these coins of עי and . The king ruling in Byblus at the time of Alexander’s invasion of Phoenicia bore the name of Ainel, or, in Greek, Enylos as given by Arrian. 46 Of this ruler we possess tetrobols bearing local types. The weights of some of these pieces belong to the Attic system. As this is the very first occurrence of that system in the Byblite coinage, it is proba- ble that these particular coins were struck after the submission of the city to Alexander. The name of the king on these coins reads עינאלּ (Ainel). Now the first two letters of this inscription are exactly the two that appear beneath the throne on No. 3586 (Plate VI, 3). In other words, they prove that this tetradrachm was struck by Enylos. Again, following the local issues of Enylos, there exists 47 another group of small denominations of local types and Attic weight bearing the name of the next ruler אדרמלך or Adramelek. Is it not at once apparent that, the monogram on the subsequent tetradrachms (Nos. 3587-3652, Plate VI, 4) is but the ligature of the letters ΑΔΡΑ, the first portion of Adramelek’s name in Greek ? The Alexander issues now assigned to Byblus are all struck from adjusted dies. In this they but follow the process used for the previous autonomous coinage of this city. The assignment to Berytus of No. 3653 is fairly certain. The six known varieties of this group all bear the letter B in the field and are closely allied by style with the coinages of both Byblus and Sidon. In fact, the indications as furnished by style are so strong, that hardly any other attribution is possible. As there are no really early issues known, it appears probable that a mint was not opened at Berytus until after the death of Alexander. At this time the chaotic conditions prevalent almost everywhere in the Empire favored the assumption by various cities of the right to strike money. That Berytus had not yet grown equal in importance to her rivals on the north and south may be surmised from the comparative scarcity of her coinage. A plausible attribution of these coins is still impossible, though the style and details of both obverse and reverse dies show certain affinities with the issues of Sidon. As the Alexander coinage of this mint has been studied in a special monograph, 48 references to that work have been given rather than to Müller who was aware of but a portion of the known varieties. It will prove unnecessary to go into details here, as these the reader may find described and discussed in the above-mentioned work. The Sidonian Alexander coinage was inaugurated almost immediately upon Alexander’s arrival in that city. During the following two years the Phoenician letter צ, the initial of the city’s name צןד, is found in the field of the tetradrachms, while beneath the throne are the alphabetical dates א or ב. The series that follows omits dates entirely, substitutes the Greek letters Σ or ΣΙ of the city’s name, and on two varieties places a symbol in the field. In 327 B. C. the custom of dating the issues is re-introduced and the Phoenician date letters ז ה, ט, י, appear in the field. In the course of the year 323 B. C. Greek alphabetical dates are substituted for the Phoenician. In 320 B.C. the name of Philip replaces that of Alexander. The last date known to have occurred in the Demanhur hoard is O, which corresponds to the year falling between the first of October 319 B. C. and the thirtieth of September 318 B. C. It is interesting and important to note that every known variety of the Sidonian Alexander tetradrachm, from the first opening of the mint down to the year O (319-318 B.C.) is represented in our hoard. This would seem to be an opportune time to suggest a possible explanation for the curious absence of any apparent coinage during the year Λ (323-322 B. C.). Our lack of coins, either in gold or silver, for this year can hardly be due to chance. It would be strange indeed if the Demanhur hoard, so well provided with all the remaining Sidonian issues, should lack any examples of this particular date. The same is true of other large Alexander hoards known to the writer who, furthermore, for the last fifteen years has carried on an active search for the missing date — but without success. As long ago as 1909 Mr. Hill drew attention 49 to the absence of any coins dated Λ and suggested that Müller (or rather Mionnet, his source) might have misread Λ as A on his coin No. 1420. The coin has unfortunately since disappeared and we have no means of checking the reading. The coin, however, was placed by Müller among those of later style, Nos. 1415 to 1422, and these the present writer has elsewhere 50 shown must cer- tainly be attributed to Sinope. It will at once be seen that year 10 (י and Κ) 52 is conspicuous for possessing more obverse and reverse dies than any other one year. With its six obverses and six reverses it is far above the average of some two or three dies (obverse or reverse) engraved and used yearly. The case of the silver issues for the tenth year is not quite so marked as that of the gold. For while, even here, we find that the י and Κ issues have two obverse dies and five reverse dies, this is a high but not an exceptional figure for the Sidonian coinage. The case of the gold, however, remains very striking. Now the only alternative to the somewhat unlikely supposition that there really was no coinage in the year Λ is to suppose that י and Κ actually represent different years. But it is certain that י is ten. Then Κ must be the following year—and at once a simple explanation arises to the mind to account for the seeming anomaly. It must be remembered that the die engravers at Sidon were assuredly not Greeks but native Phoenicians. They had used the Phoenician alphabet to designate the dates 1(א), 2(ב), 7(ז), 8(ח), 9(ט), 10(י). The next date would have been represented in their alphabet by ב, the eleventh letter. But if now, at the commencement of the new year, the order came in to replace the Phoenician alphabetical dates with Greek letters, what would have been the most natural thing for a Phoenician die cutter, thinking of the Greek alphabet in terms of his own, to have done ? Obviously, instead of engraving the next succeeding or eleventh Phoenician letter, namely, ב Kaph, it is very likely that unthinkingly he might have used its actual Greek equivalent, namely Κ. Now Κ is the eleventh letter in the Greek numerical (decadic) system, though here it stands for 20. In the alphabetical system, however, it is only ten, as digamma was omitted. Thus there were two stumbling blocks for the unwary Phoenician to trip over in making a hasty shift from his own alphabetical dates to the Greek. Probably it was brought to the attention of the local authorities even- tually that Κ did not represent eleven in the Greek alphabetical numeration, as its equivalent Kaph does in the Phoenician. Perhaps, however, the mistake was not noticed until many coins bearing the offending Κ had already been issued, and so it was not deemed advisable, because of the resultant confusion, to strike new coins that year bearing the more correct Λ. So Κ was allowed to continue doing duty for Λ. But at the commencement of the new year, the twelfth after the coming of Alexander to Phoenicia, the correct alphabetical designation of this year, namely Μ, was placed upon the coinage. This would seem to offer a simple as well as a plausible explanation for the otherwise surprising fact of the apparent lack of any coinage in the year Λ. By assigning the Κ coins to the eleventh instead of to the tenth year, we also do away with the surprisingly large number of dies which we otherwise would have to give to the latter year. The first few issues at Ake bear only magistrate symbols or letters. Then there was adopted the initial letter צ of the city’s name צבן; to be followed not long afterwards by the more complete form צך. Sometime in the year corresponding to 327-326 B. C., a system of dating according to the regnal years of the local dynast was introduced. This occurred in the twentieth year of that ruler. The latest date included in the Demanhur hoard is his 29th year, corresponding to 319-318 B. C. (Plate VII, 2). Being dated, the two coinages of Sidon and Ake furnish us with the surest criterion for determining the true date at which our hoard was buried. Unfortunately, when first treating of the find, 55 the material at the writer’s disposal was insufficient to appreciate these Ake dates in their true significance. Instead, the most reasonable one of the many views held by previous writers on the subject was adopted. The Ake dates were referred to the era of Alexander the Great in Phoenicia, which took its inception with the Autumn of 333 B.C. This, however, caused the last Ake date, known to have occurred in the find, to be very much at variance with the evidence offered by the Sidonian dates from the same source. The facile explanation of this disturbing discrepancy lay in the fact that the writer was well aware that at that time he had seen but a portion of the original hoard, and therefore many important varieties might have escaped him. The question was most interesting and important, and so special endeavors were made to secure all available material for the study of the dated issues of both Sidon and Ake. This resulted in the eventual publication by the Yale Press of a monograph entirely devoted to this one subject. Here it was possible to prove that the dates used on the AkeAlexanders cannot refer to any era of Alexander the Great, Seleucus I, or such other eras as had been suggested by previous students. The dates can only refer to the regnal years of some local dynast. They were first used in the twentieth year of his reign, which corresponds with 327-326 B.C. This changes the aspect of things entirely, brings the Ake dates into complete concordance with those of Sidon in the Demanhur hoard, and considerably alters the date previously suggested for the burial of that hoard. In his review 56 of the author’s work on Ake, Mr. Hill makes the suggestion that the dates found on the Alexandrine coinage of that city may be based on an era inaugurated at the end of the great Phoenician rebellion of 348 B. C. In other words, he hesitates to accept our dates as representing the regnal years of a local potentate. Mr. Hill’s suggestion is indeed plausible, and it is only after mature consideration that the writer still adheres to his former supposition. For between the end of the rebellion, with its supposititious granting of greater freedom to Ake, and the arrival of Alexander, some fifteen or sixteen years had elapsed. No coinage, autonomous or otherwise, had in the meanwhile appeared in Ake to establish the custom of dating by that era. The importance of this era to Ake must have been completely overshadowed in 333 B. C. by the cataclysmic arrival of the Greeks and the fundamental changes brought about by that event in all Phoenicia. To the authorities in Ake, in the year 327 B. C., the compara- tively recent events of 333 B.C. must have appeared of far more importance and significance — at least so it seems reasonable to assume —than those of 348 B.C. We know things were vastly altered in 333332 B.C., but we have absolutely no historical records to show that, as far as Ake was concerned, there had been the granting of any special privilege of such importance that a new era should therefore be inaugurated. It seems much more probable to suppose merely that a new king had secured the power, or that a more loyal subject had been appointed by the Persian king as dynast in Ake. Now there would be nothing so very extraordinary in a local ruler in 327326 B. C. adopting his regnal years as a means to date a purely local coinage of the Alexandrine type. At this very time a king of Byblus places his monogram on his coinage, a little later Pumiathon of Citium places his name, regnal dates, and types upon his gold coinage, while Nicocles of Paphos engraves his name in full upon his Alexanders. For these reasons the writer feels justified in retaining his theory of regnal years to explain the dates found on the Alexander issues of Ake. The mints which once issued the above pieces may have lain, to judge by the style of the coins themselves, in Cilicia, Cyprus, Syria, or even Phoenicia. The symbol found on Nos. 3976-8 is very similar to the reverse type of the autonomous issues of Soli in Cilicia. On the other hand the Persic staters issued under Alexander from the central mint of Tarsus bear the initials Σ, Μ, Ι, Τ (= Soli, Mallus, Issus, Tarsus). This would seem to prove that Soli, as well as Mallus and Issus, possessed no separate mints of their own at this time. We should note, however, that the bunch of grapes with tendril and leaf as held in the hand of Dionysus is a conspicuous feature on the latest autonomous staters of Nagidus. As we know of no other Alexander coinage for the important dis- trict of western Cilicia, and as the style of our coins would easily admit of such an attribution, it is quite probable that they were struck in Nagidus. Concerning No. 3979 nothing definite can be said until future finds come to our aid with new specimens or varieties. This piece does not appear to fit in with any of the issues of such mints as we have already studied. Its style, however, is not unlike some of the later issues of Cyprus. Babylon — the greatest city of Asia and the capital of empires from the days of Hammurabi, the law giver — had probably possessed a mint under the Persian kings. Continued by Alexander it became, next to the Macedonian mint of Amphipolis, the most important in all his Empire. Here, until the removal of the mint to Seleucia on the Tigris, were struck an extraordinary quantity of coins. Our ancient authorities make the assertion that Alexander intended to continue this great metropolis as the capital and centre of his own empire, and it is reasonable to suppose therefore that a mint commensurate with this importance would soon be established here. Babylon at this time was the central mart of the East. Hither ran the great overland trade route from India and Bactria via Ecbatana. Here were also the wharfs for the ships which in their holds carried the goods of farthest Asia via the Coromandel Coast, through the Persian Gulf and so up to Babil or Bâb-ilî,. meaning “the Gate of the Gods,” in fact the “Sublime Porte” of the ancients. Hence the imported goods, as also those for which Babylon itself was famous, such as embroideries, rugs, and fabrics of various kinds, were taken up the Tigris or Euphrates and thence to shores of the Mediterranean or into Asia Minor. When the armies of Alexander and the genius of their commander had made one empire from the Adriatic to the Indus, the importance of Babylon, temporarily, increased many fold. For now the markets of the West were thrown wide open, the freedom and safety of the trade routes by land and sea assured, the demand for eastern luxuries fostered and made possible of acquirement among the Greeks by the sudden influx of immense quantities of booty and treasure from the conquered cities of Asia. For all this traffic Babylon remained the focus of the land and sea routes until about 300 B.C. By that time Alexandria in Egypt had grown into an important city, and, because of the skilful policy of Ptolemy and the constant internecine wars of the Diadochi, which made land travel especially unsafe and intermittent, had deflected a large part of this traffic by way of the Red Sea to herself. But throughout the last quarter of the fourth century B. C., Babylon flourished exceedingly. During this time quantities of coin were apparently issued by her very active mint. The Demanhur hoard contained a large and representative series of the Babylonian tetradrachm issues covering the first twelve years of their production. Only a tabulated list of the varieties known to have been in the find is here given. The minute discussion of these varieties, their true sequence, their dates, together with the many other points of historic, numismatic, and archaeological interest they present, must be left to a more propitious moment when it will be possible to publish a monograph devoted to this coinage as a whole. Only in this way will it be possible to do justice to one of the greatest and most interesting series of all the Alexander coinage. The late M. Imhoof-Blumer was the first to recognize the true origin of this series and to attribute it to Babylon. 57 But even he hardly appreciated the magnitude and importance of the coinage. The dies for the coins of Series I (Nos. 3980 to 4057) were adjusted ↑↑ in accordance with the system employed under Persian rule for the darics and sigli. With the employment of new die cutters, commencing with No. 4058, the dies are no longer adjusted. Svoronos has assigned 58 four early types of the Alexander tetradrachm to Alexandria in Egypt, and they were all represented in the Demanhur Find. One of these varieties, however, has had to be assigned by the present writer to Asia Minor (here Nos. 1751-1754) because of its style and other close affinities with the issues of that district. The remaining varieties were certainly struck in Egypt. To them must be added the types here enumerated under Nos. 4610-4747 and 4820-4821, for these coins are identical in style and fabric with the pieces correctly given to Alexandria by Svoronos. Furthermore, specimens have occurred in six other Egyptian hoards known to the writer, 59 while they are seldom met with outside of Egypt. The large number and extraordinary preservation of the specimens from Demanhur would seem finally to confirm their supposed Egyptian ori- gin. It is interesting to note that the type with the rose as symbol possessed more specimens in the Demanhur find than any other one type (all together 134 pieces, or 138 if we add the slight variant Nos. 4610-4614). Originally there may have been many more than this number, as was the case with another of the Egyptian types. In his letter M. Dattari stated to the writer that there were over a hundred specimens in the find of the ‘Khnum’ (Nos. 4748–4780) type, although the writer actually saw only 33 specimens of this beautiful coin. An interesting point brought out by a study of the Demanhur hoard is the fact that no mint was apparently opened by Alexander in Egypt until at a comparatively late date. This was suggested by M. Svoronos in his work on the Ptolemaic coinage, but is now definitely confirmed by our hoard. From the evidence of the dated coins of Sidon and Ake, the hoard cannot have been buried before 318 B. C. Now there are only five distinct varieties of the tetradrachm in our hoard that can be assigned to Alexandria; and of these, two — those with the Ear of Barley (VII, 3) and the Pegasus symbols (VIII, 1)—represent very small issues. 60 The style exhibited by these coins is so similar throughout that their issue could not have covered a very long period of time. If we assign the opening of the Alexandria mint, then, to in and around the year 326-325 B. C., we shall probably not be far wrong. These Alexandrian issues were first used as a model for the Sidonian coinage in the year which ran from October 1, 325, to September 30, 324 B. C.
It is still somewhat uncertain whether our hoard contained any specimens of the next series of Egyptian Alexander tetradrachms, those, namely, with the portrait of Alexander himself, clothed in the elephant’s skin head-dress, on the obverse (Svoronos, Nos. 18-24,93). These must have followed closely upon the series described above, as the Zeus figure of the reverse is identical in style and details with that found on our coins. One variety, moreover (Svoronos, No. 93), has the same symbol and monogram as our Nos. 4822-4826. M. Dattari was of the opinion that the Demanhur Hoard contained ten of these pieces. Although M. Dattari is in all probability absolutely right, they have not been included in our study, as the writer has throughout been careful to limit himself only to the pieces he has actually seen and handled. Little further can be added to the notes on punchmarks and “graffiti,” as discussed by the writer in his previous study of the Demanhur hoard. Only four varieties of punchmarks have been noted on coins from this hoard. The first consists of a pellet in the centre of a sunken circle, with six rays running out from the pellet to the circle’s edge, the whole resembling a wheel. This punchmark was found on only one coin in the hoard, Plate VIII, No. 2. The second type occurs somewhat more frequently. Usually indistinct and poorly struck up, it seems to represent a human eye. Three specimens (coins of Amphipolis, Salamis, and Byblus) are given on Plate VIII, 3-5. The third punchmark appears just once, on a coin of Tarsus, here Plate VIII, No. 6. It consists apparently of the three Phoenician letters, צמי, in an oblong depression. The fourth punchmark consists of a small circle containing a raised pellet. The pellet is joined to the circle at top and bottom by narrow necks or bands. This type of punchmark occurred twice in our hoard, once on a coin of type 2334-2338 and once on a coin of type 3300-3301. “Graffiti,” or letters scratched on the surface (usually on the reverse), are of very frequent occurrence on coins from the Demanhur find. The letters may be Greek or Phoenician, and, as a rule, come singly or in pairs. In some cases we seem to have Phoenician words of three or more letters. These are probably names. They furnish enough material for a special monograph on the subject. As such a monograph has been promised by Prof. C. C. Torrey of Yale, the present writer, who makes no pretences to Semitic scholarship, will be forgiven if he leaves this interesting subject to a more able pen. From more than one point of view the Demanhur hoard is of peculiar value and interest to us. By mere size alone it is most impressive. In point of fact it is the largest hoard of Alexander tetradrachms ever known to have been found. It is also the second earliest hoard of this denomination, the earliest being the Kyparissia Find recently described. 61 Of surpassing value to us, however, is the fact that because of its size and scope it contained practically every variety of the Alexander tetradrachm coined previous to 320 B. C. The issues of the succeeding two or three years are well, though not completely, represented. It thus furnishes us with a remarkable survey of the coinage of this particular denomination as issued by Alexander the Great, and enables us to establish, once for all, what types were or were not struck during his lifetime. The distortion of view, which might be expected to have been shown by a hoard of widely struck coins buried in a province lying as much to one side as is the case with Egypt, is hardly noticeable. The issues of only one or two mints have suffered, the remainder are represented in direct proportion to the size and importance of their tetradrachm issues. The two largest of Alexander’s mints, Amphipolis and Babylon, furnish us with 1582 and 630 coins respectively, or together nearly one half of the entire hoard as it has come down to us. The only distortions noticeable are indeed slight. 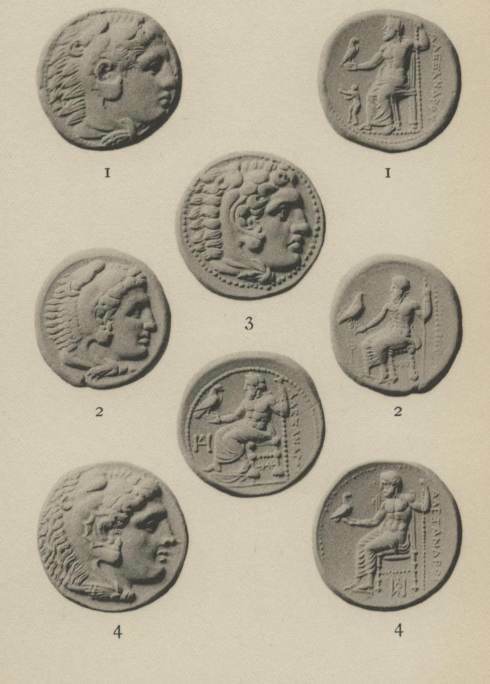 One or two varieties of the Pella mint seem to be missing, while the early tetradrachms of northern and western Asia Minor are not very strongly represented. Judgments as to the true size of the various mintages are based by the writer on his carefully kept records of the number of obverse and reverse dies known for the various mints. To illustrate, a brief table is here appended showing the number of dies used at some of the most important mints for the period covered by the Demanhur hoard. These totals have been secured from a study of the thousands of Alexander tetradrachms preserved in the various public and private collections of Europe and America. Mint. Obverse dies known. Reverse dies known. Number of coins in Demanhur Hoard. Apparently, then, our hoard is able to furnish us with easily accessible and fairly accurate criteria for gauging the comparative sizes of the various issues of the tetradrachm under Alexander the Great. To determine the approximate burial date of the Demanhur Hoard is not difficult — now that the dated coinages of Sidon and Ake are better understood. Of these Sidonian issues every year is represented from א through י, and the succeeding Greek dates from Κ to Ο inclusive. The tetradrachm bearing the last-named date must have been coined between October 1st of 319 and September 30 of 318 B. C. Similarly, every Ake date is represented from the first use of dates on its coins in the 20th year of the local dynast’s reign down to and including his 29th year. The writer has elsewhere 63 shown that these dates are to be reckoned from the year 348-347 B.C., which brings the year 29 to 319-318 B. C. Thus both series exactly agree in placing the probable burial of the Demanhur Hoard at a date not earlier than the commencement of 318 B. C. On the other hand, the hoard could not have been buried much after the commencement of 317 at the latest. The dated coin series of both Sidon and Ake were continued uninterruptedly for many years after this date. The fact that their issues are frequently met with in Egyptian finds speaks volumes for a constant and close commercial relationship between Egypt and Phoenicia at this very time. Therefore the sudden stoppage in the Demanhur Hoard of the Sidonian coinage at the year Ο, and of the Ake coinage at the corresponding year 29 — while the preceding coinages without a single exception are well represented in the find — is highly significant. That the burial of our hoard took place in 318 B. C., or at most soon after the commencement of 317 B. C., is fully corroborated by other though somewhat less definite clues which the contents of our hoard offers. For instance, the coins issued in the name of Philip Arrhidaeus (323-317 B.C.) are well though not completely represented. To be noted is the fact that it is always the latest of his issues, or his coinages in distant mints, that invariably are missing. Thus for Sidon we lack any specimens dated Π (Oct. 4, 318-Sept 30, 317 B. C.). We also miss the common varieties listed by Müller under Nos. 1, 20, 54-56, 84-85, 92, 100, 108, 111, 113-115, 117, 120, 125, 129, etc. Clear-cut cases are those of the Persian mint (Ecbatana?) and Babylon. The former first commenced to coin towards the end of the reign of Philip Arrhidaeus, but none of its very common issues are to be found in the Demanhur find. The Philip issues of the Babylon mint, in the order of their appearance, are represented by Müller’s Nos. 99, 104, 103, 24, 26, 29, and 117. Of these the first five are well represented in our hoard, though in ever diminishing numbers. No. 29 is represented by but one specimen in mint state, while the exceedingly common variety No. 117 is conspicuous by its complete absence. The final Philip issues of other near-by mints, such as Aradus and Salamis, are also noticeably absent. Thus it can be seen that we would not be far wrong in adopting the year 318 B. C. as the probable burial date of the Demanhur Hoard. The entire lack of any reliable information concerning the find spot of our hoard, or its mode of burial, leaves the field wide open for numberless conjectures respecting its former owner and his immediate reasons for burying so great a treasure. To allow our fancy to stray among so many fascinating possibilities would serve no useful end. Arguments could be adduced with equal plausibility to prove our hoard a government treasure, a military war chest, the accumulation of a wealthy merchant, or even robbers’ loot hidden away in a moment of danger. The facts are that the hoard was interred just at the moment when the land of Egypt, so far as we know, was enjoying profound peace. The great convention of the Satraps at Triparadeisus in 321 B.C. had confirmed Ptolemy In his possession of Egypt. The following year he had, in a somewhat high-handed fashion, seized upon Cyprus and Phoenicia. The other Satraps were at that time far too absorbed in their own troubles to do more than protest. The ensuing years were spent by Ptolemy in quietly organizing his kingdom and strengthening his power for the conflict he knew lay ahead. To be sure, in the year 318 B.C. — that is, the very year which apparently witnessed the interment of our hoard — a considerable flurry was occasioned in the eastern Mediterranean by the sudden descent of Eumenes upon Phoenicia. Here he seized certain large maritime cities, and upon their docks and wharves commenced to construct a fleet with the intention of securing command of the sea. Although Ptolemy was thus temporarily forced out of Phoenicia, we have no reason to suppose that his possession of Palestine was threatened or that Eumenes contemplated any immediate descent upon Egypt. Certain it is that Eumenes’ power in Phoenicia collapsed as quickly as it had arisen and that before the summer’s end he had retreated eastwards into Persia. We may be hardly justified, therefore, in associating the Demanhur burial with so distant and ephemeral a danger. The times, however, were obviously uncertain and dark clouds loomed on the political horizon. The original possessor of our hoard may have decided against taking any chance with so large a treasure, and hence proceeded to bury it before it might be too late. On the other hand, we have absolutely no historical or archaeological data to suggest any local disturbance occurring at this time. The fact remains that the great Hoard of Demanhur still guards its secret as absolutely as did its ancient owner after he consigned his treasure to the ground two thousand two hundred and forty years ago. Reattribution of Certain Tetradrachms of Alexander the Great. Within the last three years M. Dattari has informed me of a find of 3000 Alexander tetradrachms, and not long afterwards of a hoard of 46,000 Roman coins. These seem to be but average occurrences. Tarsos under Alexander, Amer. Jour. Num., vol. LII, and Myriandros–Alexandria kat’Isson, in vol. LIII of that publication. Numismatic Notes and Monographs, No. 3, The Kyparissia Hoard. Numismatique d' Alexandre le Grand, p. 5, ff. Ludwig Müller, Numismatique d'Alexandre le Grand, pp. 304 ff. ; Dr. Jules Rouvier in the Revue Numismatique, 1909, pp. 321 ff. ; G. F. Hill, Notes on the Alexandrine Coinage of Phoenicia, in Nomisma, IV, 1909, p. 12. The Dated Alexander Coinage of Sidon and Ake, pp. 55 to 59. The correct interpretation of these dates is absolutely verified by three finds at our disposal. l. c., pp. 57 and 58. Amongst others, Müller Nos. 68, 69, 70, 115, 116, 191, 192, 193. Note also that we possess two tetradrachms of Philip II having the peculiarity of the Zeus head facing to the left. In style they are identical with our tetradrachms Nos. 1599 to 1603, and bear the same symbols: bee or Θ. Compare Plate II, 1 and 2 with Imhoof-Blumer Monnaies Grecques, p. 117, No. 17 and Catalogue of the Th. Thomas Sale, No. 1017. Now in the writer’s coll. Now in the Athens coll. Babelon, Traité II2, Pl. CLXXVIII, also probably Pl. CLXXII, 7. Von Fritze in Nomisma, IX, pp. 49 ff. Babelon, Traité II2, pp. 56-60, 69-73. Müller, Pl. XXVI, No. 308, and British Museum Cat., Caria , Introd., p. cviii. Brit. Mus. Cat., Arabia, etc., Introd., p. cxxxv, and Mr. Milne in Num. Chron., 1916, pp. 1 ff. Hausoullier, Études sur l'Histoire de Milet et du Didymeion, p. 8. Tarsos under Alexander, Amer. Jour. Num., vol. LII. For a possible Alexander coinage at Nagidus, see the discussion of Nos. 3976-8. Droysen, Geschichte des Hellenismus, II, 1, p. 26. “A Cilician Find,” Num. Chron., 1914. 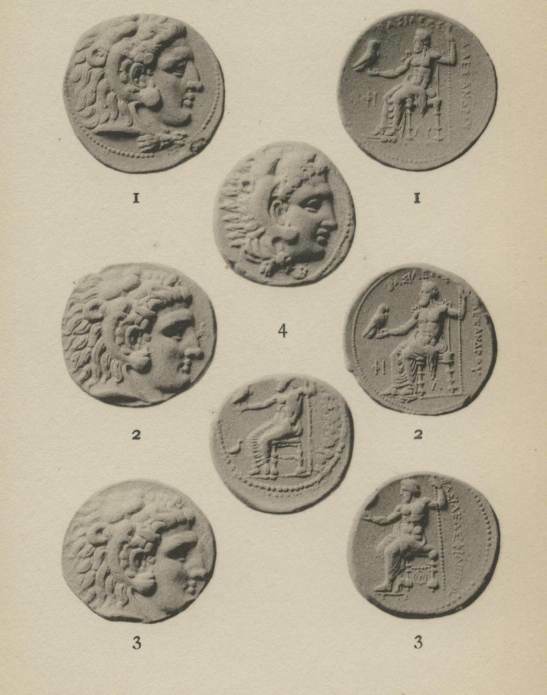 For instance, a hoard of the later tetradrachms was unearthed in Egypt in 1896 and has been described by Dutilh, in the Journal internationale d'archéologie et numismatique, I, 1898, pp. 148-156. Single specimens have also reached the writer from Egypt. See “Tarsos under Alexander," l. c., passim. See Brit. Mus. Cat., Cyprus , No. 85, Pl. XII, 19. See Num. Chron., 4th Ser., vol. XIX, pp. 64, 65. But see E. S. G. Robinson’s “ Aspeisas, Satrap of Susiana ” in Num. Chron., 5th Ser., vol. I. pp. 37. 38. Brit. Mus. Cat., Cyprus , Nos. 1-23. J. P. Six in Num. Chron. N. S., Vol. xviii, pp. 103-131. Brit. Mus. Cat., Galatia, Cappadocia, and Syria , Plate XVII, No. 7. Arrian, Anab. ii, 13, 7ff. Rev. Num., 3d Ser., vol. IX, 1891, Pl. XII, 2. Script, linguaeque phoen. monum., p. 270, tab. XXXV, 1. Musei Hedervarii numos antiquos graecos et latinos descripsit. Vienna, 1814. Sestini, Descrizioned’alcunemedaglie Greche del Museo Hedervariano. Florence, 1822-1829. As has been claimed by M. J. N. Svoronos, Τὰ Νομίσματα τοῦ Κράτους τῶν Πτoλεμαῖων, and followed by Mr. Hill in his “ Notes on the Alexandrine Coinage of Phoenicia,” Nomisma, IV, 1909. Reattribution of Certain Tetradrachms of Alexander the Great, Amer. Jour. of Num., vol. XLVI, 1912, pp. 42-44. Brit. Mus. Cat. Phoenicia , No. 10, Plate XII, 3. E. T. Newell, The Dated Alexander Coinage of Sidon and Ake. New Haven, The Yale Press, 1916. Notes on the Alexandrine Coinage of Phoenicia, Nomisma, IV, 1909, p. 9, note 1. The Alexander Issues of Sinope, Amer. Jour, of Num., vol. LII. As the writer himself believed, p. 32. The Dated Alexander Coinage of Sidon and Ake. As both the Phoenician י and the Greek K, when used for alphabetical numerals, represent 10, all the issues bearing these dates have been assigned to the single year from October 1, 324 to September 30, 323 B. C.
The Dated Alexander Coinage of Sidon and Ake. New Haven, Yale Press, 1916. Amer. Jour, of Num., Vols. XLV, XLVI, 1911-12, passim. Num. Chron., 4th Ser., Vol. XVI, 1916, pp. 407-9. Die Münzstätte Babylon, Num. Zeitschr, vol. XXVII, 1895. He later successfully defended this assignment against Sir Henry Howarth’s rather old-fashioned objections (Num. Chron., 4th Ser., vol. IV, with Imhoof-Blumer’s rejoinder in vol. VI). Τὰ Νομίσματα τοῦ Κράτους τῶν Πτoλεμαίων. Nos. 3, 6, 12, 94· Ιn reality No. 94 he assigned to Corinth under Ptolemaic suzerainty and this coin will have to be returned to Egypt, as Corinth was not held by the Egyptians until long after the burial of the Demanhur hoard. 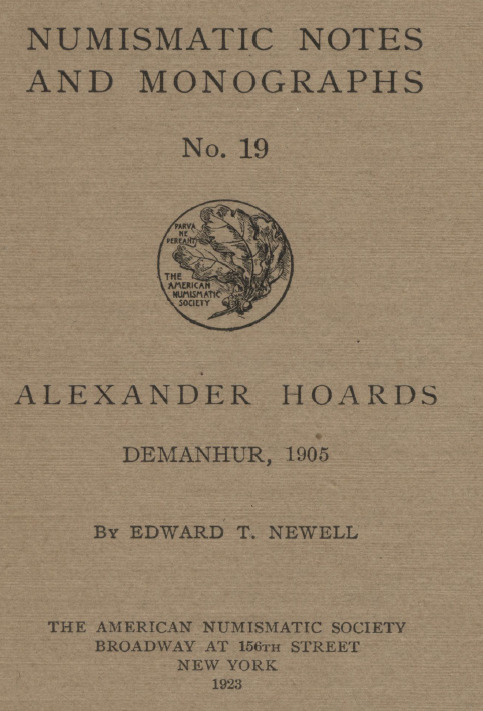 Two hoards described by Dutilh, Annuaire de Numismatique, 1895, vol. XVII; the find made near Kuft (largely represented in the collection of the late Dr. Strachan Davidson and now preserved in the Ashmolean Museum, Oxford); and three smaller hoards from Egypt now in the writer’s possession. Aside from the comparatively small number of extant specimens only a few dies were apparently used in their production. The issues cannot, therefore, have been large. Numismatic Notes and Monographs, No. 3. In the cases of Tarsus, Myriandrus, Sidon, and Ake there are included in these totals such obverse and reverse dies as have been brought to the writer’s attention since the publication of his various monographs on these particular mints. The Dated Alexander Coinage of Sidon and Ake. Sydney P. Noe. Coin Hoards. 1921. 47 pages. 6 plates. 50c. Edward T. Newell. Octobols of Histiæa. 1921. 25 pages. 2 plates. 50c. Edward T. Newell. Alexander Hoards — Introduction and Kyparissia Hoard. 1921. 21 pages. 2 plates. 50c. Howland Wood. The Mexican Revolutionary Coinage, 1913-1916. 1921. 44 pages. 26 plates. $2.00. Leonidas Westervelt. The Jenny Lind Medals and Tokens. 1921. 25 pages. 9 plates. 50C. Agnes Baldwin. Five Roman Gold Medallions. 1921. 103 pages. 8 plates. $1.50. Sydney P. Noe. Medallic Work of A. A. Weinman. 1921. 31 pages. 17 plates. $1.00. Gilbert S. Perez. The Mint of the Philippine Islands. 1921. 8 pages. 4 plates. 50c. David Eugene Smith, LL.D. Computing Jetons. 1921. 70 pages. 25 plates. $1.50. Edward T. Newell. The First Seleucid Coinage of Tyre. 1921. 40 pages. 8 plates. $1.00. Harrold E. Gillingham. French Orders and Decorations. 1922. 110 pages. 35 plates. $2.00. Howland Wood. Gold Dollars of 1858. 1922. 7 pages. 2 plates. 50c. R. B. Whitehead. Pre-Mohammedan Coinage of Northwestern India. 1922. 56 pages. 15 plates. $2.00. George F. Hill. Attambelos I of Characene. 1922. 12 pages. 3 plates. $1.00. M. P. Vlasto. Taras Oikistes (A Contribution to Tarentine Numismatics). 1922. 234 pages. 13 plates. $3.50. Howland Wood. Commemorative Coinage of United States. 1922. 63 pages. 7 plates. $1.50. Agnes Baldwin. Six Roman Bronze Medallions. 1923. 39 pages. 6 plates. $1.50. Howland Wood. Tegucigalpa Coinage of 1823. 1923. 16 pages. 2 plates. 50c.